I have just returned to Perth after hosting a golf tour to the Mornington Peninsula, a two hour drive south of Melbourne, Victoria. 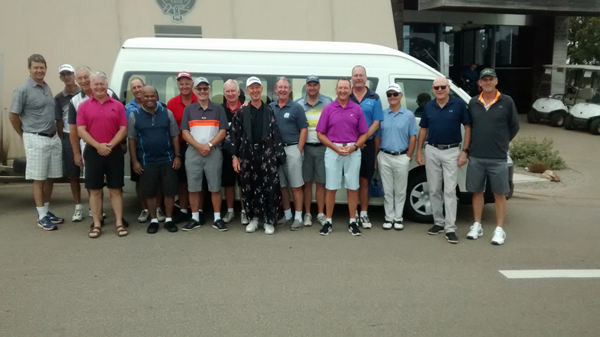 The group of 18 golfers were mainly from my private golf club in Perth, Melville Glades and we travel away each year to a different golfing destination. In 2018 we visited Mornington Peninsula, and it was such an enjoyable trip, we returned this year! This year we again based ourselves at Rye at the 4-star Moonlight Bay Resort, and played some of the excellent courses in the region called the “Cups” for its range and quality of links courses. This year, we returned to play The Dunes and the Legends course at Moonah Links which are favourites of this group as well as St Andrews Beach and the Old Course at National Golf Club. They are all excellent golf courses, however the standout this year was the round at the National Golf Club. This was my first experience of the National, and it did not disappoint. It is a quite exclusive Club, with a magnificent Clubhouse overlooking the Bass Strait and three championship courses to choose from. Both the Ocean and Moonah courses are rated highly however, the Old Course is just a spectacular feast for the golfing eyes! A Robert Trent Jones Junior classic design, every hole seemed to run in a different direction with wild elevation changes, dense bush surrounding the fairways and subtle and strategic design elements that made a round at the Old Course both memorable and praise-worthy. When we return to the Mornington Peninsula again, the National Golf Club will be #1 on the list of courses to play. 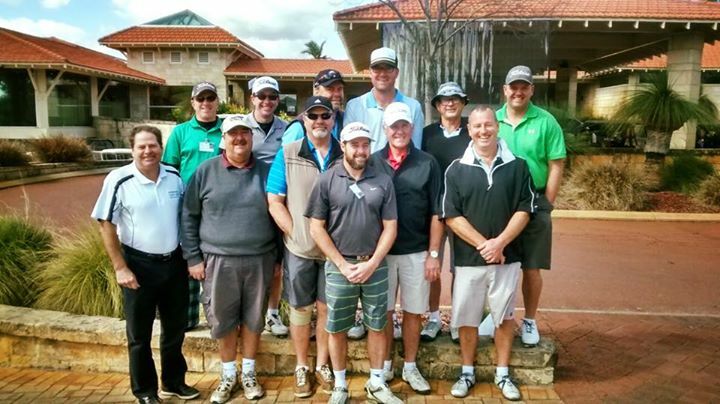 A great golf trip with a top bunch of guys, who are keen to head back to a different golfing destination in 2020. The coastal golf courses of the Sydney Eastern Suburbs including NSW Golf Club and St Michaels are on the list, as is a return to Barnbougle Dunes in Northern Tasmania. Whichever it is, travelling away on a golf tour with a great bunch of guys with a common interest of golf is a great experience. If you are interested in a short-break “great golfing experience” in Australia, you cannot do any better than the golf courses around the Mornington Peninsula. Speak to the guys at IGS for itinerary and golfing concepts that will ensure a memorable golfing trip for you and your golfing mates. Queenstown, New Zealand has become one of the “must visit” tourist destinations in the world, whether it be for the acclaimed snow sports or the amazing golf courses in the region. International Golf Specialists has seen a big increase in recent years for interest in golfing tours and packages to Queenstown. The best time to visit Queenstown for golf is between November and April, where the days are sunny and the longest daylight. There is also a lot if interest in the NZ Open which is normally staged in early March in Queenstown and where International Golf Specialists hosts an exclusive golf tour around this professional golf event. 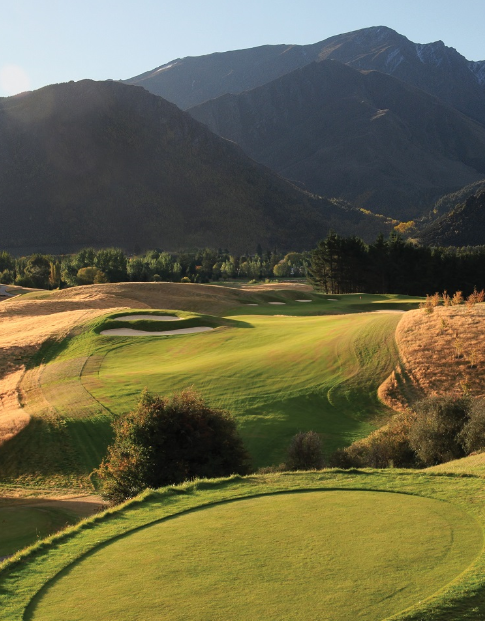 As with our ever popular Barnbougle Dunes tours, this Queenstown adventure will bring golfers from around Australia to enjoy 5 rounds at Queenstown’s finest golf courses, including Jack’s Point, Millbrook, Kelvin Heights and Arrowtown Golf Course. 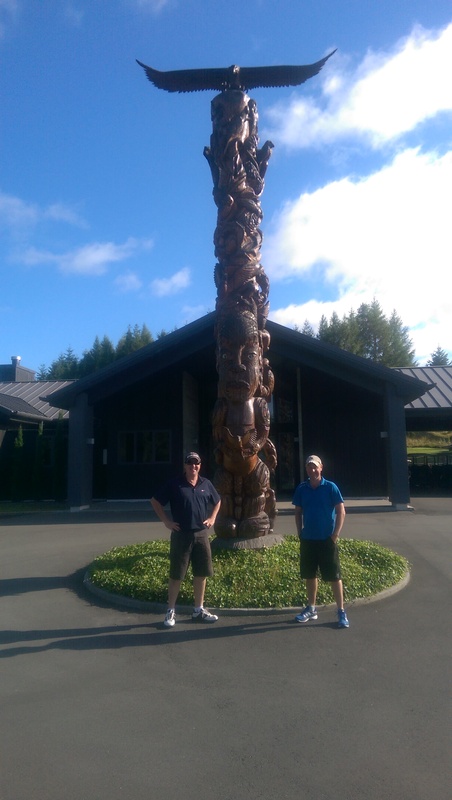 IGS hosted a golf group from Newcastle to Queenstown in December and the feedback was very positive. The group had a week in Queenstown with 4 rounds of golf, then hired some minivans and drove to Christchurch via the Alpine Way through Otago and Canterbury. Not only did they enjoy the golf on offer, they experienced an exhilarating ride in the Shotover Express, and also a lake cruise and dinner to Walters Peak Farm for an unforgettable evening. Wine tasting at some of the world-famous Otago wineries was also included to complement this memorable golf tour experience. Group leader Allan MacDonald summed it up “some of our group had not been to Queenstown before, and all they have talked about since the trip is when can they return. We agreed that as there is so much to do and experienced, you need at least 10 days there to take it all in. International Golf Specialists did a great job in organising the trip, and we will be using them again for another golfing trip in 2019”! International Golf Specialists can take you to Jacks Point and other great golf courses around the Queenstown and Otago region of New Zealand on one of its exclusive golf tours. 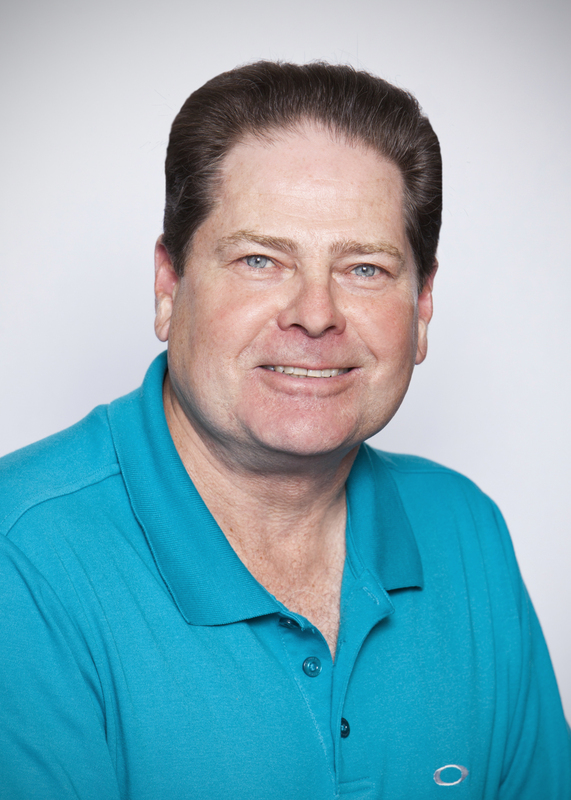 Talk to Gary about the many possibilities of “great golfing experiences” provided by International Golf Specialists. 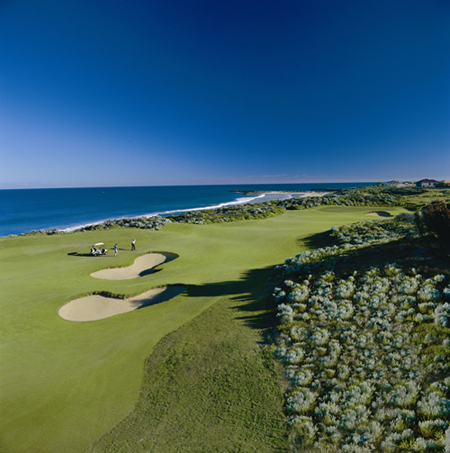 West Australian golf tours offer a huge variety of courses and golfing challenges. Amongst the best in the state is Joondalup Resort, a 27 holes layout, and a must play for anyone visiting Perth. The immaculate presentation of this course is mirrored in its sister course of Meadow Springs, which is located just 45 minutes from the CBD. Both of these courses are high on the list of the best in WA for playability, conditioning, and facilities. For those who enjoy traditional links golf, The Cut and Kennedy Bay are two of the best links layouts in Australia. Both are amazing golf experiences which are made even more interesting and challenging when the sea breeze blows in from the nearby Indian Ocean. In fact, you would be hard pressed to find two links courses of such quality, and in such proximity to each other, anywhere in the world. 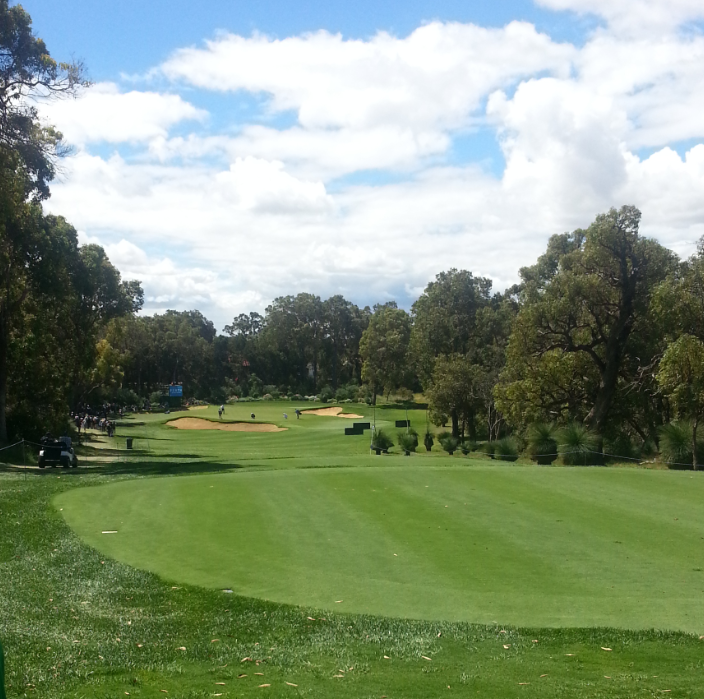 Another course which is always highly recommended for golfers visiting Perth is Araluen Country Club. There is no such thing as a bad hole at Araluen. Even players having their worst of days will find themselves enjoying every one of the 18 fantastic holes. With dramatic changes in elevation, testing greens and stunning views around the course, Araluen is a favourite with many locals and a course that must be seen to be believed. To take in some of the country courses around Western Australia, the southwest of the state has an abundance of great courses and tourist attractions. Dunsborough Lakes near Margaret River, Bunbury GC and Busselton GC are all located within an hour of each other and make a fantastic golf tour, especially when combined with the other attractions throughout the southwest region. The city of Albany in the state’s south provides some amazing golf at Albany GC where you can always expect four seasons in one day. 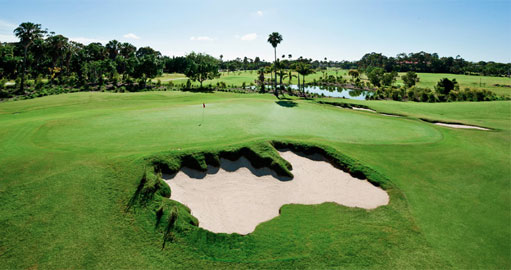 Lush fairways and perfect greens greet any golfer who makes the journey to this historic town. In contrast, Kalgoorlie Golf Course is etched into the red dust of the West Australian desert, just outside of one of the largest gold producing towns in the world. Kalgoorlie is Australia’s longest course, when played of the back tees, and looks like an oasis in the desert with the green fairways and greens popping out from an otherwise barren landscape. Western Australian is a land full of diversity and one that provides endless options of golf and activities for all travellers visiting its shores. What kind of a leader board did the US Open produce this year? Well, it certainly wasn&rsquo;t one featuring many of the pre-tournament favourites! They were all gone early as Erin Hills GC played tough from tee to green but whose greens ran as smooth and as true as any before seen in a US Open. Australia&rsquo;s main hopes of Jason Day and Adam Scott faded early and both missed the cut with scores which made every amateur feel a little better about their own game. A four under 68 in the first round from Marc Leishman was his best round of the week but his scoring only got worse from there. At least he managed to play the weekend though which saw him earn a tie for 27th. World Number 1 and defending champion Dustin Johnson had a horror tournament failing to make the cut with two rounds in the mid 70&rsquo;s, while Rory McIlroy was never able to recover from a 78 in his first round, and his second score of 71 also saw the World Number 2 have the weekend off. No one could take anything away from Brooks Koepka however whose final round of 67 saw him take his first major victory and a four shot win over fellow American Brian Harman and Japan&rsquo;s World Number 4, Hideki Matsuyama. Koepka&rsquo;s score of 16 under par was also a tie for the lowest winning score at a US Open, equalling Rory McIlroy&rsquo;s total when he won the 2011 event held at Congressional Country Club. Koepka had a putt on the last to hold the record outright at -17 but he calmly two putted from around 20 feet to claim his national championship. There will be plenty more to come from the big hitting American, whose power off the tee is matched by one of the best wedge games in the business. His touch around the green was also sublime and this year&rsquo;s US Open will surely be the first of many major championships. Expect him to feature in upcoming events and at The British Open from July 20 -23rd. His ability to control trajectory, distance off the tee and accuracy into greens will see him as one of the players to watch around Royal Birkdale Golf Club. For we mere mortals of the game, seeing some of the game&rsquo;s biggest stars falter makes us realise that there really is a fine line between pleasure and pain in the game of golf and that every player can have good rounds amongst the frustrating ones. One of the best things about golf is that it is a game we can play anywhere around the world and the places we dream of playing, we look forward to and then remember &ndash; no matter how well, or otherwise, we scored. International Golf Specialists can&rsquo;t help you get the ball in the hole any easier but we can arrange the best golfing holiday for you and your golfing partners. With tours and holidays to some of the best golfing destinations in the world, the team at International Golf Specialists can create the perfect golf itinerary for you. Golf getaways are a great way to recharge and refocus and are a fantastic way to get out of the norm and provide the perfect break from our busy day to day lives. International Golf Specialists have packages and tours to some of the best golf destinations in Australia. We’ve already done the hard work for you and know our destinations firsthand which enables us to tailor a package to suit you and your travelling companions. Here we cover two of our most popular Australian golf breaks. Western Australia. Visitors to Perth come for many reasons – most of which involve enjoying the amazing outdoors lifestyle. A great year round climate allows access to some of the country’s best golf courses. 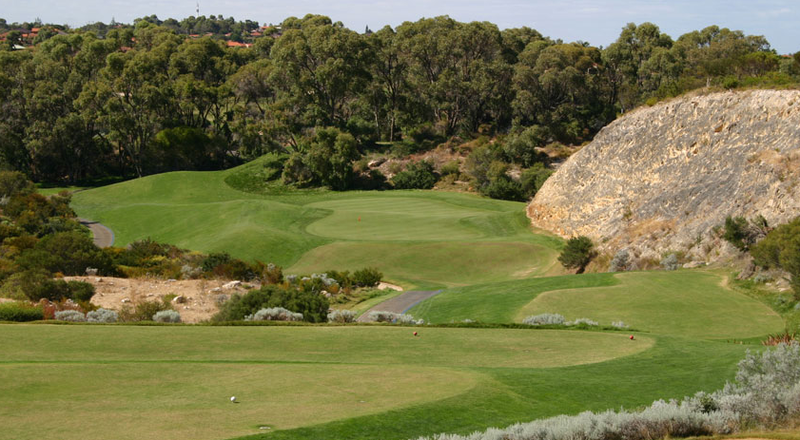 No trip here would be complete without playing Joondalup Resort and its sister course Meadow Springs. The Cut and Kennedy Bay are two of the best links layouts you’re ever likely to play and Araluen Resort will round out any golfing getaway to Australia’s most relaxed capital city. A three or four night stay in Perth at any of our quality accommodation options, provides ease of access to all these courses and more, while their close proximity often allows our guests the option of multiple rounds in a day. Tasmania. 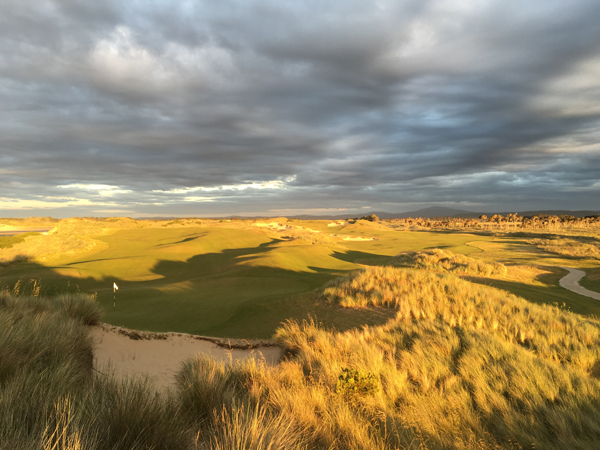 High on the list of many golfer’s priority courses are Barnbougle Dunes and Lost Farm. Visually stunning and located in one of the most pristine and unspoilt corners of the world, these two exceptional layouts will have you eagerly planning your next trip to the Emerald Isle. Tasmania Country Club offers a completely different type of golf experience and provides our Tasmanian guests a great way to round off a quick break to one of the fastest growing golf destinations on the planet. Whether you’re looking for a quick break to an exciting and vibrant city or you want to experience golf as it was first intended to be played, in pristine isolation, International Golf Specialists have the ideal golf holiday or mini break for you. Every golfer has a dream destination that they would love to visit for a golfing holiday. Accessibility to some of the world&rsquo;s best golf courses has become easier in recent years with golf tourism becoming more popular and clubs around the world opening their doors to accommodate players wishing to play their course. Using a golf travel provider to arrange your golf holiday comes with many advantages. Firstly, it removes the hassle and stress of arranging flights, accommodation at the best hotels and tee times. While doing some things for yourself online can be cheaper, the reality is that when it comes to golf travel, experts in the field such as International Golf Specialists not only make the holiday hassle free from start to finish, they are also able to provide better tee times and rates for most parts of the holiday than people who are doing it for themselves. International Golf Specialists recently led a group of American golfers on their golf holiday on a lifetime to Queenstown in New Zealand, where they took in a week of golf at some of the best courses in the world. 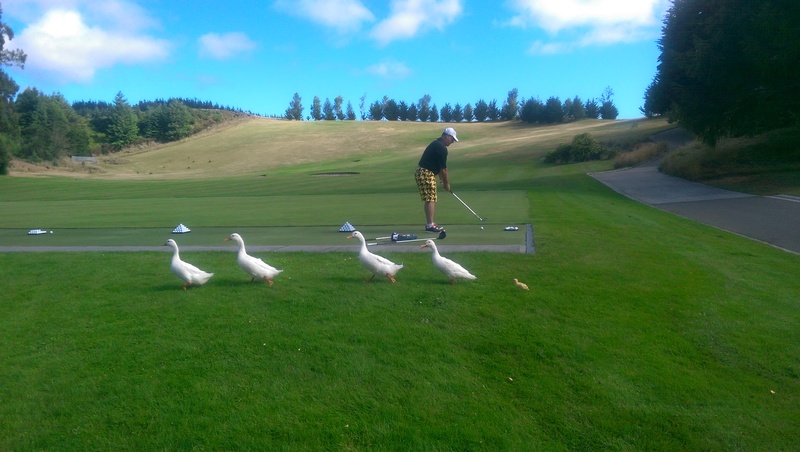 Our New Zealand supply partner had arranged everything so well that the group commented it was the best golf holiday they had ever experienced. Having tee times, hire clubs, golf carts and transportation from hotels to and from the courses, meant the group could sit around and relax after our rounds and enjoy a drink and food at the clubhouses. With many hours left in the day after the golfing was done, the group took in experiences such as Shotover Jet Boating, wine tasting, gold panning, fly fishing and para gliding. Accommodation in Queenstown was located centrally and meant restaurants, bars and attractions were all within easy walking distance. The advantage of using a specialist in the field of golf holidays was apparent with the requests from this group for IGS to arrange their next golf holiday to Australia in 2018. In bound golf holidays to Perth are growing in popularity largely due to people from around Australia and internationally taking advantage of the services on offer from IGS, who are based in Western Australia. Having Western Australia&rsquo;s number one golf tour operator arrange a golf holiday in their home state is advantageous in so many ways. Managing Director of IGS, Gary Allomes often provides hosted tours for groups staying in Perth. As a capable golfer playing of low single figures, a president of one of the private clubs in Perth and with over 40 years of experience in the travel industry, Gary knows what is required to provide the best of golf holidays. 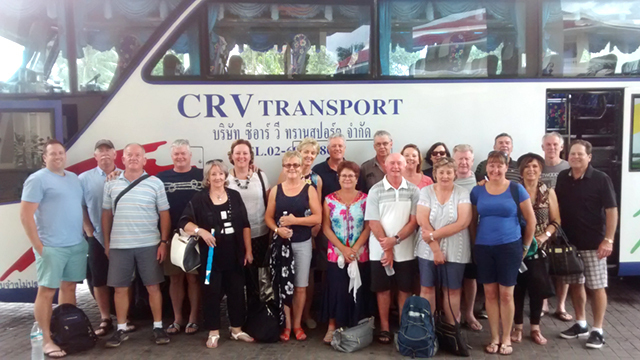 Gary also takes groups each year on hosted tours to Tasmania, Thailand and Vietnam. The numbers of people on these golf tours are growing every year and the majority of the guests are repeat customers who are returning for some more IGS hospitality. These tours are often the highlight of a golfer&rsquo;s calendar, and with new products and tours added each year by International Golf Specialists, there are always new guests from all around the country wanting to come along with our groups for a golfing holiday to one of their dream destinations. To arrange your next golf holiday, speak to the guys at International Golf Specialists. They have the expertise and experience to create the best itinerary for you and your travelling partners. Non-golfing travellers are also accommodated for with our recommendations of great activities away from the golf addicts within the group. BARNBOUGLE DUNES GOLF TOURS &hellip; a unique golfing experience! After overnighting in Launceston, the group played Launceston Golf Club, a pleasant and challenging parkland course that has previously ranked in the Australian Top 100 golf course list. A private members club makes this a very special opportunity to play the best golf course in the Launceston region and prepare for golfing experiences to come! After the round it was off by private coach on the 1 &frac12; hour&rsquo;s drive through the Tamar Valley to Barnbougle Links Resort. Barnbougle is an amazing golfing destination, located 80 kilometres north east of Launceston, just near the seaside fishing village of Bridport. There are two purpose built links courses, the older Dunes course and the newer Lost Farm course. Both are constructed within and around the sand dunes of the Forrester River, and sit adjacent to Bass Strait. Both courses have famous American designers, Tom Doak (Dunes) and Bill Coore (Lost Farm) and are designed on the lines of the famous British and Irish links courses. The Dunes is only 10 years old, but looks like it has been around for a hundred years. 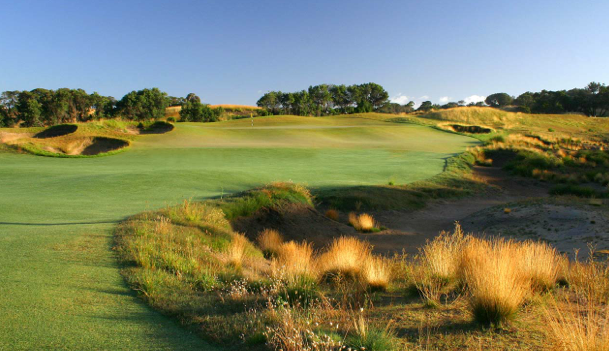 The Dunes course is Australian Golf Digest #1 Public Access course in Australia &hellip; Lost Farm is #2! The weather was exceptional and with clear skies and only light breezes, it made playing these two magnificent courses rounds to remember. Staying on-course in the Dunes Cottages just adds to the golfing atmosphere, and to wake up to the abundant wildlife outside the cottages and the 1st tee 20 metres from the cottage veranda was something special. There is nothing like Barbougle Links Resort &hellip; you have to experience it to understand its unique qualities! After 3 nights at the Resort, it was back to Launceston Airport for a short flight to Melbourne and a 2 hour private coach transfer to Portsea on the Mornington Peninsula. Staying at the 5 star Portsea Village Resort was just the ticket for a relaxed start to the Mornington Peninsula sector of the golf tour. The next day we played the Dunes &hellip; a Tony Cashmore designed championship course that was hosting its Club Championships that week. With greens running at 13 &frac12; on the stimpmeter and the group electing for the Member&rsquo;s tees, it was a great test of golfing skill and stamina. Fortunately, we were in carts, which made the long walks between greens and tees a little less tiresome, however it is a mighty golf course, and in my opinion, the best on the Peninsula. On the last day, we played a very interesting golf course in St Andrews Beach. Designed by Tom Doak, it can only be described as &ldquo;quirky&rdquo;, with at least 7 greens where you cannot see the bottom of the flag from the fairways. This was a bit disconcerting when you are not used to &ldquo;blind&rdquo; golf, however it is a memorable and fun course to play and rates as one of the more difficult courses in Australia. 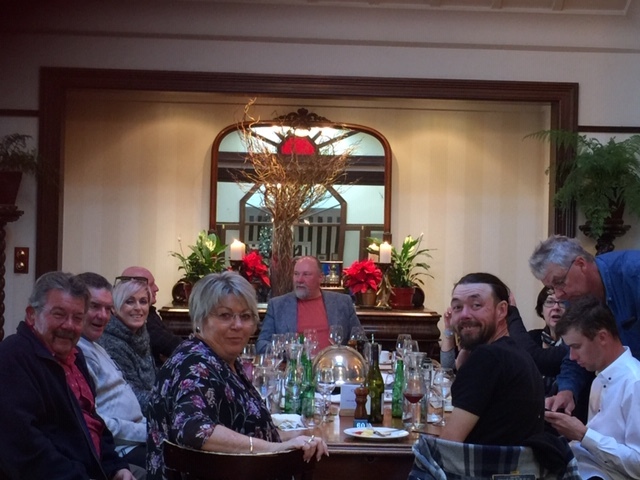 After golf and a freshen up, we headed back to Melbourne where some of the group had elected to stay on for a few days, while the rest of us headed to Melbourne Airport for home ports. A great golf trip with a top bunch of guys, who are keen to head back to Mornington Peninsula for a dedicated golf tour in 2018 that will include 13th Beach golf course as well! Life is all about experiences, and at International Golf Specialists we offer our guests the best options in golf tours. We customise itineraries for each of our groups to ensure their time at their chosen destination will maximise the best golf and attractions on offer. Expanding our range of golf holidays to include more of Asia and New Zealand Golf Packages in 2017 will mean our guests will have the chance to take an IGS golf holiday to even more of the best courses in the world. Our ever-popular Tasmanian holidays include the amazing Barnbougle Dunes and Lost Farm while those with a taste for some warmer weather may want to escape the colder months on one of our Bali tours and take in the splendour of Bali National Golf Club and Nirwana Golf Club. Add New Kuta GC into your time in one of our most popular of golf holiday destinations, and you’ll have a golf tour to remember. Millbrook Resort, Jack&rsquo;s Point, The Hills, Arrowtown and Kelvin Heights are within a 15-minute drive of Queenstown and showcase the rugged beauty of New Zealand. 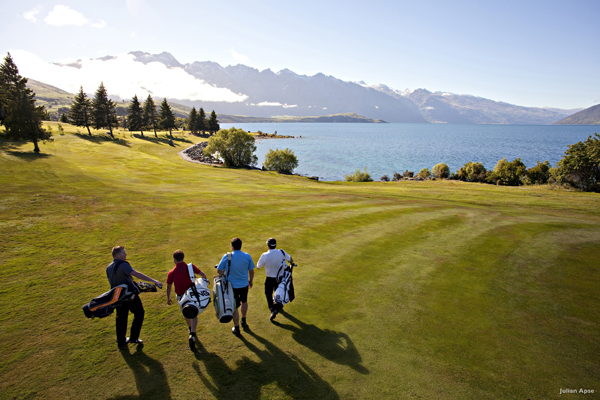 Teeing off against a dramatic backdrop of razorback mountain ranges or the crystal waters of Lake Wakatipu, golfing here is not only an experience you will never forget but one you will be in a hurry to get back to and take on again. New Zealand has so many amazing courses, most of which are addressed in the same way we talk of the greats such as St Andrews and Pebble Beach. There is no need to add the words &lsquo;Golf Course&rsquo; after each of these names, the golfing world already knows what they mean. Off course, the activities on offer will cater for every requirement. 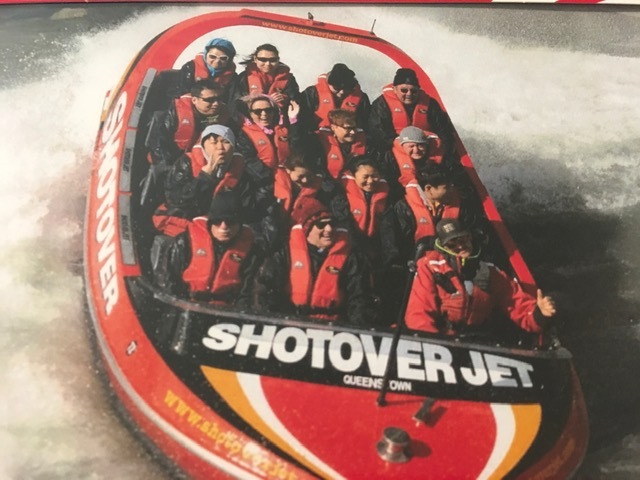 The Shotover Jet boat ride will see you hurtling through the narrow canyons of the Shotover River, reaching speeds of almost 100kph. Bungy jumping, parachuting and paragliding are all available for the more adventurous at heart, while those of us who tend to lay-up to an island green, may want to visit one of the many great wineries throughout the region or try their hand at fly fishing or gold panning. Whatever golf experience you require, IGS can combine the best of Queenstown golf with fantastic accommodation options. To begin planning your next golf holiday, speak with the team at International Golf Specialists. With over 40 years of experience in the travel industry and a love for what we consider to be the greatest game of all, IGS have the knowledge and the passion to turn your golf holiday dreams into a reality. International Golf Specialists (IGS) provide the best golf packages and tours to some of the greatest golfing destinations in the world. The Bali Golf packages IGS offer ensure some of the most relaxing and easily accessible of golf holidays. There are fantastic golf resorts in Bali where the first tee is just a short stroll from your hotel room and the walk back from the course can be made all the more enjoyable with a detour to a day spa, bar or restaurant. Bali’s Nirwana Golf Club is one such course where the natural beauty of the course and surrounds makes for an ideal day on the fairways. Located alongside is the Pan Pacific Nirwana Hotel which has well -appointed rooms and pools and bars which offer our guests the perfect way to stay and unwind. The Intercontinental Hotel is located along a beautiful stretch of beach and is another great place to stay when visiting Bali. From here IGS can arrange all transfers to any of the Balinese golf courses. 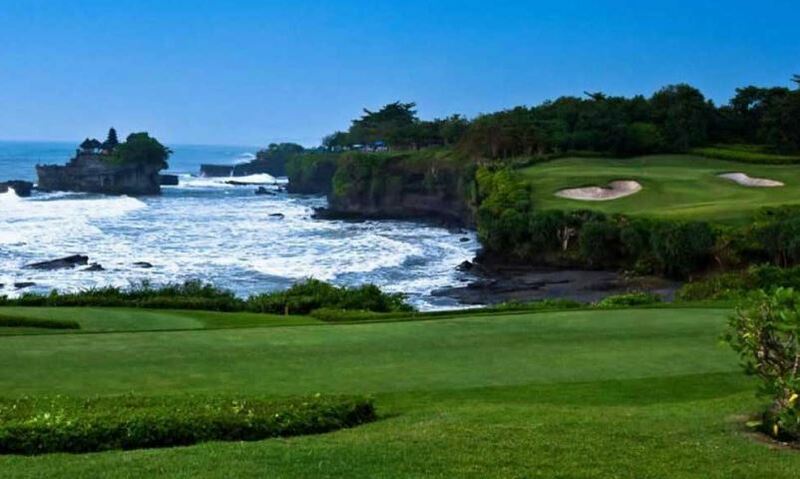 A great combination is to include Nirwana, Bali National Golf Club and New Kuta Golf Club. These three courses offer high standards of design, conditioning and facilities and each brings in its own unique aspect of golf on the holiday island. Another of our most popular Asian destinations is Thailand and the golf in Phuket will satisfy the requirement s of every golf traveler. Some of the most talked about courses in the world such as Blue Canyon, Red Mountain and Loch Palm are located here and are high on the list of golfers wanting to combine a great golfing experience with relaxation at one of the world’s best holiday destinations. With options of resort and hotel accommodation our guests can choose to stay on course or on the beach. Activities throughout Phuket mean our guests can take in adventure sports one day and then completely relax the next by chilling out on one of Phuket’s beautiful beaches or sipping cocktails around their hotel pool. For the lovers of what many consider to be the purest form of golf, Tasmania is powering ahead as a golfing hotspot with its offerings of some of the best links golf courses in the world. Barnbougle Dunes and Lost Farm remain two of our best sellers and the ever expanding golf tourism in the region now includes King Island. Just a short flight from Tasmania, two of King Island’s latest offerings include Cape Wickham and Ocean Dunes. These rapidly developing courses are easily accessible and combine well with a golf holiday to Tasmania. The importance of proper organization cannot be understated in all aspects of life and an International Golf Specialists holiday removes the guess work with a professionally constructed itinerary individualized for all of our guests. With access to the best courses and preferred tee times at our destinations, using IGS is a great way to remove any hassle from your planned holiday. Organisation of any overseas trip can be time consuming and stressful, but by speaking to the guys at International Golf Specialists, you will remove many of the hassles, with your only requirement being to get yourself and your golf bag to the airport on time. In fact, IGS can even remove that part of the equation with options of door to door transfers for both your departure and return journeys. So when you feel you deserve the best of golf holidays and want to have all aspects catered for you, speak to the experienced team at International Golf Specialists about putting together the perfect golf holiday for you and your golfing partners to the courses and places you would most like to play and visit. 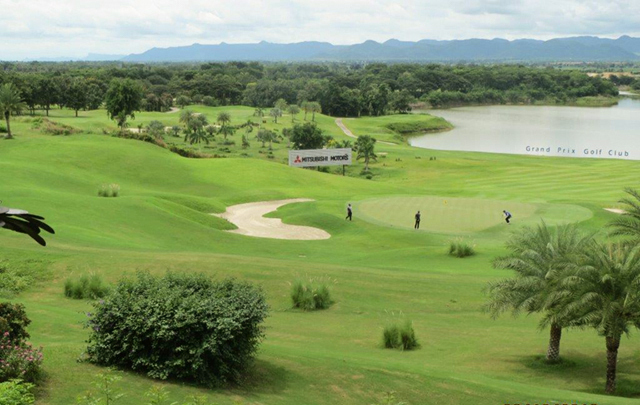 Day 5 of our golf tour to Thailand has our group of 20 keen golfers saying farewell to the luxurious Dehva Mantra Resort in Kanchanaburi and taking the one hour drive to Royal Ratchaburi Golf Club for our third round of golf on the tour. RR is described by Golfasian as a “hidden gem”, and our group were in full agreement. This is a golf course built for the locals, and it has a strong private membership base. It is a classic “old style” parkland design that is routed around magnificent mountains & valleys, with lots of natural ponds & lakes that come into play on many of the holes. The warning about the wild monkeys who “steal” golf balls was well heeded and the caddies were well versed in keeping them away from our golf balls. We all agreed this was a really fun golf course to play, and it got high ratings for enjoyment from the group. 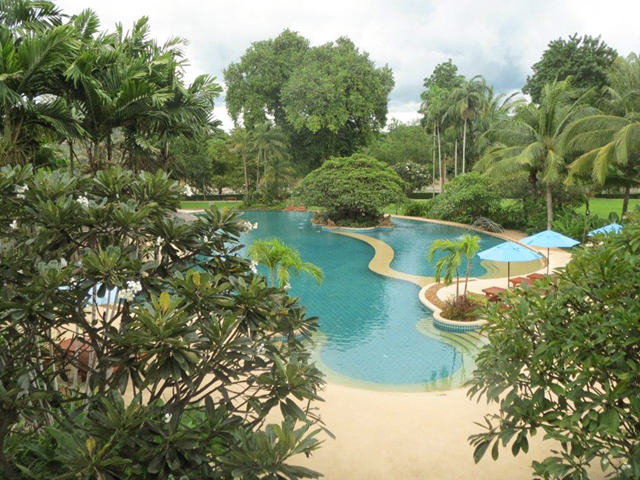 We are now settled in to our hotel in Hua Hin … the Hua Hin Marriott Resort & Spa. Only 6 months since its grand opening, this is the most impressive 5 star resort in the town. Large, spacious rooms, beautiful gardens and pool areas, with a host of dining & bar options to satisfy the most discerning guests. It should be an indulgent next few days. Now getting “psyched up” for Black Mountain & Banyan Golf Clubs! For more information about a great golfing experience in Thailand and other golfing destinations, contact the team at International Golf Specialists for a tailored and memorable golfing holiday. 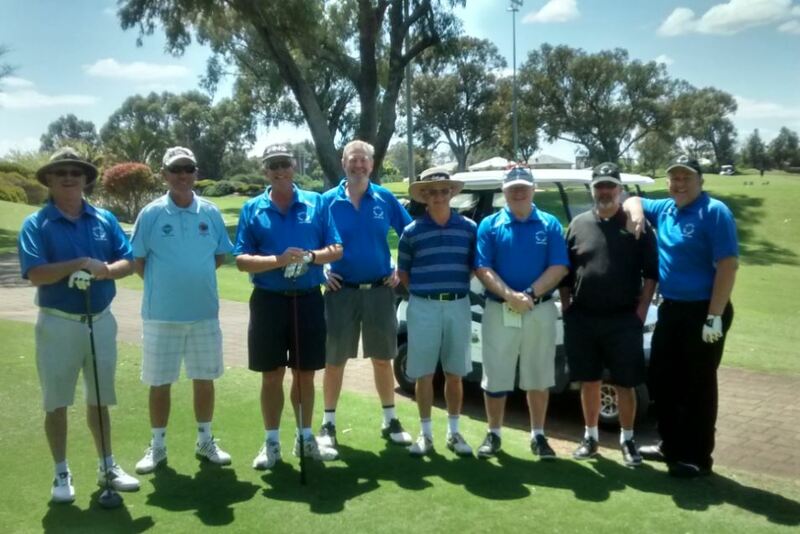 “All arrangements have been great from the accommodation to the fantastic golf courses in Mandurah. Gary Allomes has been a tremendous help in ensuring the BOCTA Cup is an enjoyable and trouble-free event for our group. We still have two rounds to play this week at Joondalup Country Club and Araluen Golf Resort and the boys are really looking forward to these championship golf course tests”. The group are currently staying at Mandurah, and have now played The Links, Kennedy Bay, Meadow Springs Country Club and The Cut. Tomorrow they move to Perth for the last two rounds. 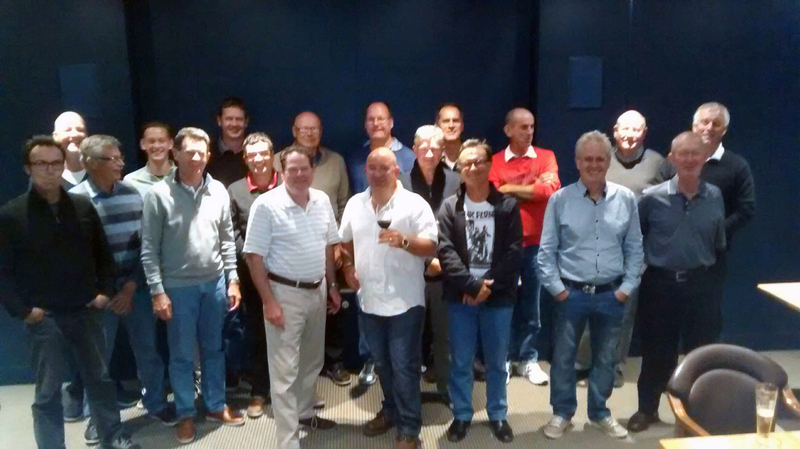 IGS Managing Director has been personally hosting the group, and stated ”what a great bunch of guys who epitomise for me what golfing trips are all about. Lots of fun, camaraderie, an interesting competition format and the accent on mateship. It has been my pleasure to look after their requirements … I hope to do it again into the future”! The golf travel bug works differently to other bugs we pick up. Unlike the common cold or flu which tends to hang around as a bit of an inconvenience, those of us with an addiction to golf never really get it out of our system. Though we may take the occasional break from the game, the desire to play is always there, as are the club-less swings in the office and practice putts rolling along the hallway carpet. Work, family and injuries can all play their part in seeing the clubs hung up in a dark corner of the shed, but sometimes all we need is a really good excuse to get back out there swinging. With accessibility to the best courses in the world improving every year, golf tragic’s can now more easily than ever take their games to other cities, states or countries. The ‘Family Holiday’ can include a set of clubs as one of the checked bags at the airport, or a week away with your best golfing mates can include some bucket list courses as well as rest and recreation. For those golfers who have taken some time away from the game, a pre-planned golfing holiday can be just the remedy to get back out on the course. Of course there is always the cramming of some long overdue practice at the range before the holiday begins. After all, the last thing any golfer wants is to perform badly and lose to his friends, even if he or she has an excuse such as a leave of absence from the game. There are so many options of great golf travel holidays on offer through International Golf Specialists. Our most popular destinations such as Tasmania and Bali are easily accessible from any capital city in Australia and our tours to New Zealand, Thailand and Mauritius continue to grow in popularity. There are some remarkable courses to be played throughout all the regions IGS offer and some incredible off course entertainment as well. 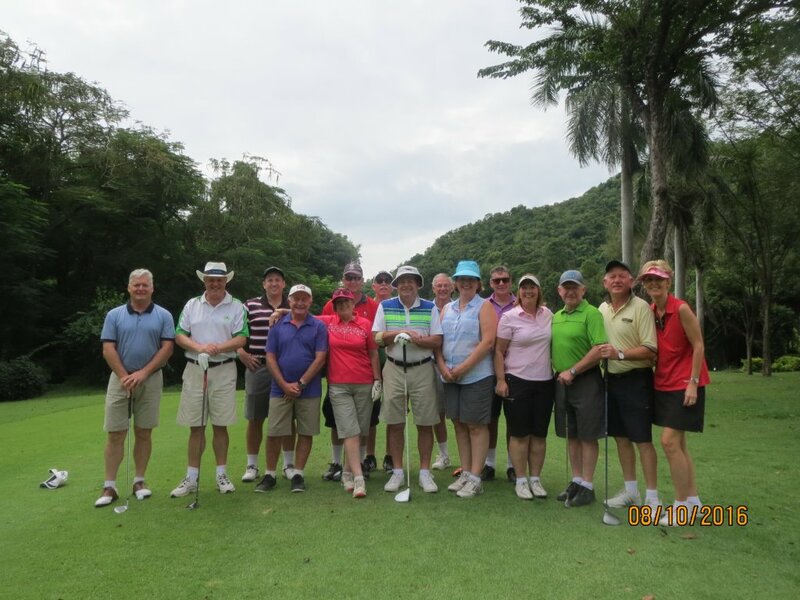 Our recent hosted tour to Thailand provided 20 guests with amazing golf and fantastic experiences throughout the tour. IGS Managing Director Gary Allomes hosted this tour personally and it is one that he is keen to take again next year. Many of this year’s participants are already booking in for the 2017 edition, such was the overwhelmingly positive result from the trip. No matter what your current golfing status - every week, every day or not since last year, International Golf Specialists can tailor a personalised golf holiday for you and your golfing partners. Our experience in the golf travel industry sees us as the premier golf travel provider in Western Australia and we are always happy to have a chat about what requirements would suit you to ensure your ultimate golfing getaway. So whether there’s a course you’ve always dreamt of playing, a country you’d love to visit (with your golf clubs), or just an excuse you need to get back into this wonderful game, speak to the team at International Golf Specialists about your next golf holiday. Contact the team at IGS for a detailed golf travel itinery to your next golf travel destination. 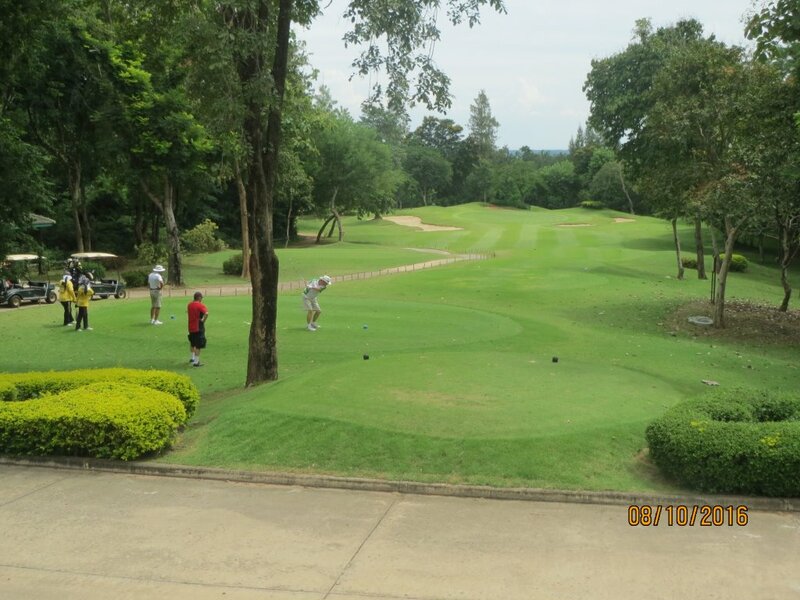 Day 3 our group travel west for 2 hours to the Kanchanburi District where we played Grand Prix Golf Club. 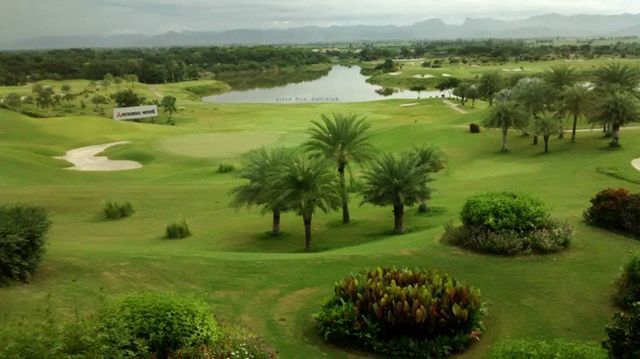 The Club is currently hosting an international junior golf tournament and the course was in magnificent condition. Grand Prix is like a stadium golf course with lots of elevation changes and severe mounding to challenge the very best golfers. Lots of water carries and the greens were running at 12 on the stimpmeter, so scoring was difficult. Grand Prix is a memorable championship golf course and one for the “bucket list”! While visiting Kanchanaburi, we stayed at the magnificent Dheva Mantra Resort & Spa, located on the famous River Kwai. What a beautiful hotel resort, designed in Indian colonial style, with beautiful gardens and located adjacent to the River Kwai. One night we went into Kanchanaburi and had dinner at a floating restaurant famous for its local Thai cuisine. 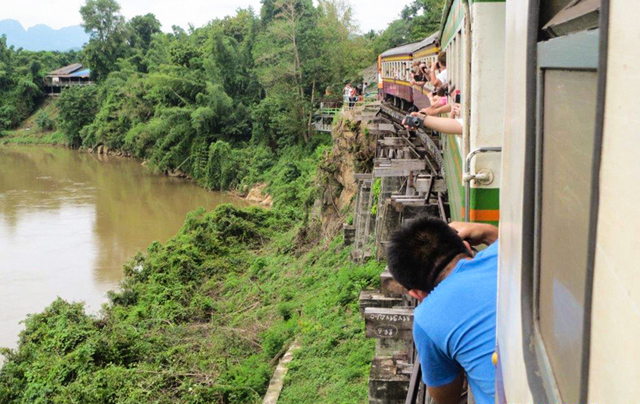 While in Kanchanaburi, the group also visited the # 1 local tourist excursion: the Burma Railway, River Kwai Bridge, Hellfire Pass & JEATH War Museum tour. 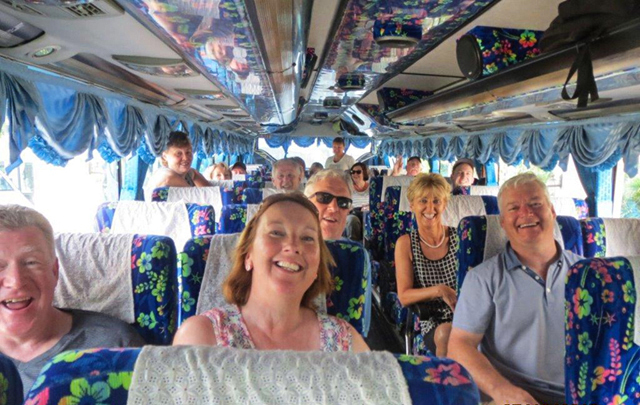 An emotional and poignant tour that honours and & commemorates the Allied POW’s who were held captive during WWII, and while Thailand was under the rule of the Japanese Army. Day 5 we headed off to Hua Hin via a round of golf at Royal Ratchaburi Golf Club. We had been told to look out for the local monkeys who are known to souvenir golf balls that stray from the fairways! I have just completed our very first hosted golf tour to Thailand with 20 keen golfers from around Australia. We had 10 nights in some very interesting parts of Thailand, including Bangkok, Kanchanaburi to the west and Hua Hin to the south. The group stayed in 5-star hotel resorts and played some of the best golf courses in the Kingdom, including Black Mountain, voted the best golf course in Thailand and South East Asia. The golf tour was arranged by Golfasian, a Bangkok-based golf travel company, and the largest inbound golf tour operator in South East Asia. Our first round of golf was at the very exclusive Thai Country Club, the venue of previous US PGA & European PGA tournaments. Past winners have been Tiger Woods, Vijay Singh and renowned local Thai professional golfer, Thongchai Jaidee. 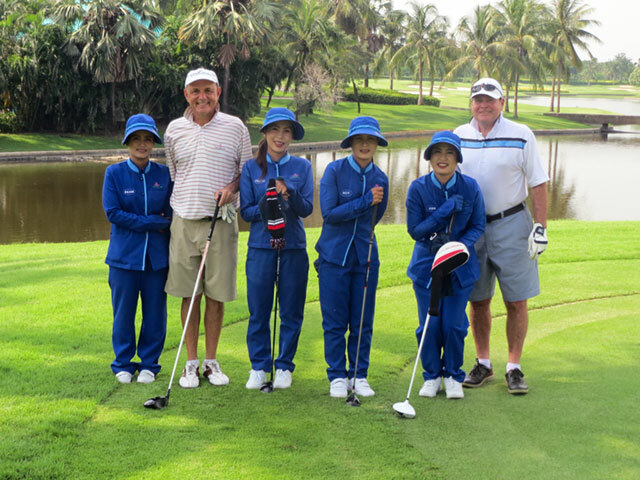 Thai Country Club is a private members club, and we were very fortunate to have Mark Siegal, Managing Director of Golfasian join our golf group for the day at his club. The golf course is tight for driving, with many lakes & ponds protecting large, fast-running greens. With punishing rough, our group’s scores were not particularly impressive, however, the golf experience was, and we agreed that a return to Thai Country Club into the future is a must! While the golfers were battling it out at Thai Country Club, the six non-golfers were enjoying a hosted excursion to the Grand Palace, a Chao Praya River cruise, lunch at an authentic Thai riverside restaurant, and finally shopping at MBK, the largest shopping mall in Thailand. After Bangkok, we head west to the Kanchanaburi District, staying at the magnificent Dheva Mantra Resort & Spa, located on the famous River Kwai. 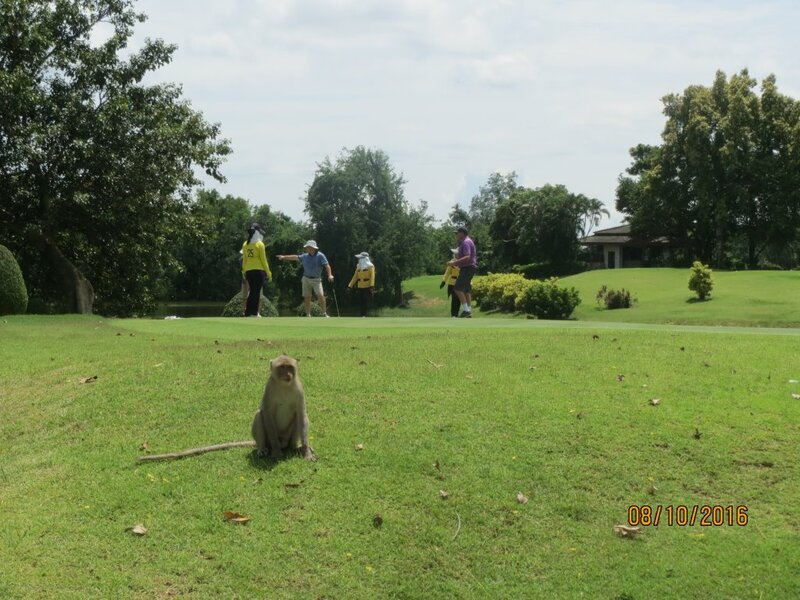 We have golf rounds at the impressive Grand Prix Golf Club and the “hidden gem”, Royal Ratchaburi Golf Club, complete with resident monkeys & amazing bird life. While in Kanchanaburi, the group will be visiting the #1 local tourist excursion the River Kwai Bridge, Hellfire Pass & JEATH War Museum tour. Next week my wife Sally & I head off to Thailand to host a special golf tour to some very interesting parts of Thailand. We are looking forward to leaving Perth’s colder temperatures and enjoying a warmer climate for the 12 days of the tour. Our group of 22 start in Bangkok for a few days, and apart from the famous shopping and sightseeing, the golfers have the thrill of playing Thai Country Club, one of the most exclusive private golf clubs in the country. After Bangkok, we head west to the Kanchanaburi District, staying at the magnificant Dheva Mantra Resort & Spa, located on the famous River Kwai. We have golf rounds at the impressive Grand Prix Golf Club and the “hidden gem”, Royal Ratchaburi Golf Club, complete with resident monkeys & amazing bird life. While in Kanchanaburi, the group will be visiting the # 1 local tourist excursion … the River Kwai Bridge, Hellfire Pass & JEATH War Museum tour. We next take a 2 hour drive to the south, where we will be visiting the town of Hua Hin, the King’s favourite summer residence which is located on the Gulf of Thailand. This is one of the most popular tourist towns in Thailand, and a welcome relief from the hectic pace and humidity of Bangkok. We will be staying at the Marriott Resort & Spa, the newest and most luxurious hotels in Hua Hin and a wonderful & relaxing base for our group. 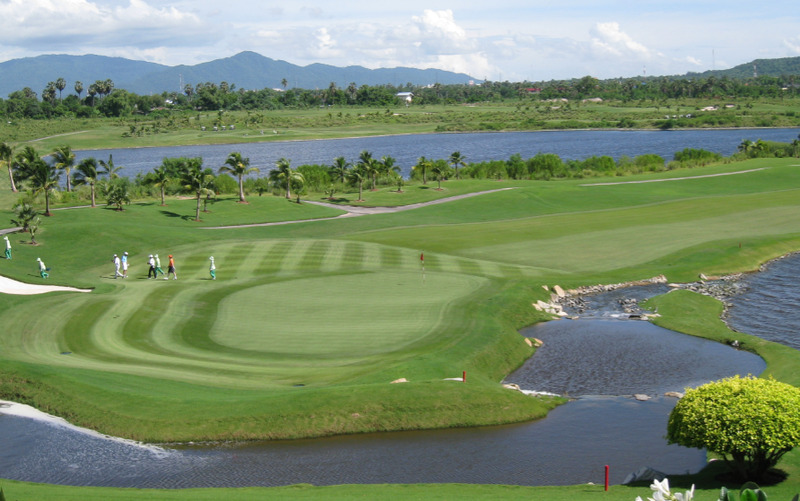 Hua Hin is where the group gets to play two of the best golf courses in Asia. Black Mountain and Banyan are regarded as the most memorable golf experiences in Thailand, and both host famous professional golf tournaments each year as well as many keen amateur golfers wanting to tick these beauties off their “bucket lists”. Other attractions while in Hua Hin are a visit to the famous Night Markets; an island tour in traditional Thai fishing boat, and also a trip to a local winery for lunch and an elephant ride around the grape vines. Mauritius offers cultural diversity, stunning landscapes and an amazing selection of quality golf courses. Often used as a gateway for people travelling to and from Europe, Mauritius provides the golfing holiday maker the chance to completely unwind and soak up the warm hospitality and the amazing on and off course experiences of this island paradise. The best months to visit Mauritius are between March and November, perfect for those wanting to escape the winter months and enjoy golf in dry and sunny conditions. The best of Mauritius golf includes The Links and Legends Golf Course, the Ernie Els designed Anahita Golf Club, Bernhard Langer’s Le Tousserok Golf Club, the Paradis Golf Club - which stretches between the Le Morne Mountain and one of the Indian Ocean’s most beautiful lagoons and the challenging and scenically beautiful Tamarina and Heritage golf courses. Each provides its own unique golf experience. When the golf is done, Mauritius provides so many other activities. Naturally, the island has many water sports such as deep sea fishing, catamaran cruises, dolphin and whale watching and deep sea diving. There’s also sky diving, helicopter scenic tours, safari parks and walking trails. In the evenings the local bars and restaurants provide amazing local cuisine. The hotels, villas and holiday apartments provide for any accommodation requirement. There are so many ways to explore Mauritius. Hire a car for the day and take a drive to the other side of the island. Mauritius offers a great range of rental vehicles including motorcycles and luxury European convertibles. Or. Sit back and relax on board a tour coach and discover the history of the destination named in 2008 as Africa’s Golfing Destination of the Year. With courses set against a backdrop of some of the most stunning scenery in the world, New Zealand is fast becoming one of the hottest golfing holiday destinations on the planet. From Kauri Cliffs and Cape Kidnappers on the North Island to Queenstown&rsquo;s incredible Jacks Point and The Hills Golf Club in the South, a golfing holiday to New Zealand has a new adventure for the golf traveller at every destination. Non golfing partners will find an abundance of activities in a country renowned for its adventure, fine food and wine and incredible landscapes. Take in any of New Zealand&rsquo;s incredible golfing destinations and the stunning scenery on offer complements the amazing activities at every turn. The local cuisine and wines are world class. Accommodation at the world&rsquo;s leading hotel chains, exclusive apartments and chateaus or holiday villas provide stays as diverse as the country itself. With a constantly changing dynamic from the top of the North Island to the bottom of the South, New Zealand golf continually provides new challenges, and each region, a completely different golfing experience. The summer and autumn months from November through to April are the best for golf in New Zealand. For those wanting to take in alpine skiing during the cooler months, there is always golf available in the towns surrounding some of the best ski fields in the world. Taupo, in the centre of the North Island, is home to the spiritual home of New Zealand golf, Wairakei International and the Jack Nicklaus designed Kinloch, one of the Golden Bear&rsquo;s fiercest links layouts. A two-hour drive to the east brings you to the beautiful Hawke&rsquo;s Bay region and the world renowned Cape Kidnappers, a course which consistently ranks inside the top 50 courses in the world and one, which many who have played both, rate above the iconic Pebble Beach. To the South Island where golfers are spoil for choice, especially around Christchurch and Queenstown. Players can be forgiven for losing concentration or even concept of time and space between shots as they take in so much of the amazing scenery encompassing the spectacular South Island layouts. A day in New Zealand can be filled with the best of golf and exciting outdoor activities. Referred to as the adventure capital of the world, visitors here can relax after a morning round with a ride along a bike trail or choose to take in sky diving, bungy jumping, white water rafting, gold panning or wine tasting. Whatever golf adventure you dream of, New Zealand can provide you with some of the best courses in the world and the most incredible adventure throughout its amazing towns and cities. In 2012, International Golf Specialists was established with the goal of providing golfers with the best golfing experiences available in the Australasian region. Since then, our product has grown to also include South Africa and Mauritius and in 2017, we will expand into the European market. Our hosted tours to Tasmania and the incredible links layouts of Barnbougle Dunes and Lost Farm, always fill fast, and most of the guests on these tours are there for the second, third of fourth time. These two courses are rated in the World’s Top 100 with Barnbougle at 33 and Lost Farm 40. The courses themselves are just part of the intrigue which is added to by the barren and isolated acreage where they are located on the northern Tasmanian coastline. The holiday island of Bali, which is so easily accessible from Australian capital cities and so affordable, is also home to three of the best courses in Asia. Nirwana Golf Club is a Greg Norman designed masterpiece, winding its way through rice paddies, ancient temples and along the stunning coastline of the Indian Ocean. Bali National Golf Club has recently come into its own as one of the premiere layouts available to visitors to Bali with some of the most superb bunkering, lakes and magnificently thought out and designed holes anywhere in the southern hemisphere. Just a short drive from Bali airport, New Kuta offers its own unique challenges, and when the winds whips off the ocean, the greens perched on top of the cliff tops high by the sea become all the more testing. International Golf Specialists have golf tours and holidays for every golfer wanting any kind of Bali golf holiday. With New Zealand golf tourism growing faster than nearly any other region in the world, IGS can offer golf travel packages to some of the best destinations that New Zealand has to offer. The country’s most popular holiday destination of Queenstown, also happens to be home to some of the best golf courses on the planet. The Hills, Jack’s Point, Millbrook Resort and Kelvin Heights are rated as some of the most scenic golf experiences that you could find anywhere. With stunning views to the Remarkable mountain ranges and Lake Wakatipu, golfers can be forgiven for losing focus on the game at hand when they take in the splendor that this region has to offer. The north Island also provides visitors with incredible golf at Cape Kidnappers – currently ranked 16 in the world, its sister course of Kauri Cliffs, Taupo’s Wairakei International and the Jack Nicklaus designed Kinloch, to name just some of the area’s best. Whatever golf holiday you are looking for, International Golf Specialists have the experience in the golf travel industry to construct your perfect golfing getaway. Our knowledge of the golf courses, accommodation and attractions at each of our destinations goes toward creating the best possible itinerary for you and your travelling party. We can recommend the best time of year to visit and, importantly, when not to visit some regions. Non-golfers are also accommodated for as we know the importance of keeping these members of the group active while the golf is played. Experience counts when it comes to planning your golf holiday and the team at International Golf Specialists have over forty years of experience in the travel industry. Combining this with the love of golf, gives them the edge in tailoring personalised golf travel itineraries for their clients, and delivers the easiest and most enjoyable holiday. The destinations they offer have been visited by the guys at IGS and they recommend the best accommodation, golf courses and activities based on each region and the requirements of all of their guests. This knowledge and their attention to detail will assist in organising every detail of your golf holiday. Whether you&rsquo;re looking to an international destination to escape the winter months and want to head to Thailand, Bali or Vietnam for world class golf and relaxation, or you want to experience the best golf in Western Australia at The Vines, Joondalup Resort, Araluen Resort, The Cut and Kennedy Bay, the IGS team have packages and solutions to meet every requirement. Wherever and whenever you want to play golf, have a chat with the IGS guys about getting your next golf holiday happening. There&rsquo;s nothing like leaving for your golf holiday knowing that someone else has organised every aspect of your time away and done the hard work for you! The organisation involved in the planning of a golf trip can be stressful and if the destination is somewhere you haven&rsquo;t been before, the main attractions, best courses and aspects of that particular place may be overlooked when arranging a golfing getaway yourself. International Golf Specialists takes the hassle out of planning a golf holiday. A tailor made itinerary through IGS means you can begin relaxing long before you leave for the airport. Our destinations include the best golfing regions in Australia, New Zealand, Mauritius and Asia. The options of activities outside of golf can be mixed in with our personalised tours so that each group and individual can enjoy the best that destination has to offer. This ability comes from our in-depth knowledge of the places we recommend. Speaking with the guys from International Golf Specialists will give you the reassurance that we have been to the places we promote, played the courses, visited the hotels and explored the regions to recommend the best activities on offer. Whether you&rsquo;re looking for a weekend break to Bali, a week soaking up the sun and relaxed lifestyle in Mauritius or you want to try the best of West Australian golf, International Golf Specialists can put together the perfect golf tour for you. 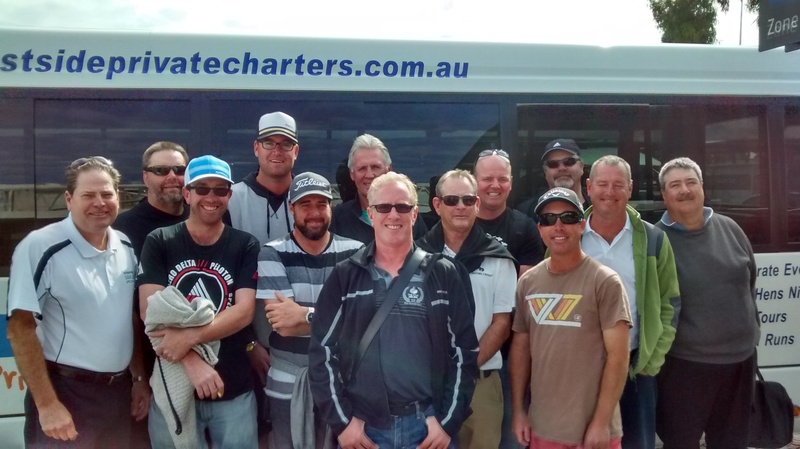 International Golf Specialists put together a 9-night golf tour to Vietnam for a group of golfers from my local golf club in Perth, Melville Glades. The focus was on golf courses around Ho Chi Min City (Saigon) and the feedback has been very positive. On a recent visit to Vietnam, I inspected some of these top golf courses, and the standout in the Saigon region is the new Greg Norman designed The Bluffs Ho Tram Strip. The photos attached are of the Hince group playing this great golf course. A short domestic flight from Saigon to Danang brings you to this coastal tourist city where there are four international standard and highly acclaimed golf courses. Designers such as Norman, Colin Montgomerie, Nick Faldo and Luke Donald ensure the reputation and credibility of this region’s great golfing experiences … something IGS can arrange for you and your golfing partners. Golf in Vietnam is very affordable, and with a favourable exchange rate, this is the perfect time to book a golf trip to this fascinating country. View our latest Vietnam Saigon golf package or IGS can custom build a Vietnam tour to suit your golfing requiements. International Golf Specialists provide everything our guests need to have the most relaxing and enjoyable of golf holidays. Some of the ‘Must Haves’ of any great golf holiday are access to the best golf courses, preferable tee times and guest specific suitability to accommodation at your chosen destination. When experiencing any new destination, planning and preparation often determine just how enjoyable your visit there will be and one of the most important aspects of arranging a golf tour or holiday is relying on the services of a golf travel company with the contacts and local knowledge of the regions they offer. International Golf Specialists work with the best local operators and suppliers at each of our destinations to provide our guests exactly what we ourselves would expect in a golf tour, taking care of everything from transfers to your nearest airport, flights, accommodation, golf and entertainment. International Golf Specialists can even arrange club hire for our guests meaning you can travel light, without the need and extra expense of carting your golf gear with you. To begin planning your next golf holiday to any of our great destinations throughout Australasia, South Africa and Mauritius, speak with the guys at International Golf Specialists today. 2016 is just around the corner and promises to be another huge year in the world of golf. With so much excitement across all the world’s tours throughout 2015, the emergence of so much new talent and the fulfilling of the promise shown by players such as Jason Day and Jordan Spieth, the upcoming year will eagerly anticipated by players and spectators alike. Most of us can’t wait for the year’s first Major, the US Masters to be played at the famed Augusta National from April 7 – 10. The only Major played at the same venue each year always delivers incredible drama and amazing golf. The game returns to the Olympic Games in Rio de Janiero for the first time since the 1904 Summer Olympics and will comprise the top 60 men’s and women’s players as ranked on July 11th 2016. The format will be a 72 hole stroke play event, hosted at the brand new and specially built course at Reserva de Marapendi in the Barra da Tijuca zone. Australia will be well represented with a number of our best male and female competitors sure to perform well in what will be a prize as sought after as any Major Championship. To make 2016 an unforgettable year and visit the courses and destinations you have always wanted to experience, speak to the team at International Golf Specialists today about making your golfing dream a reality. 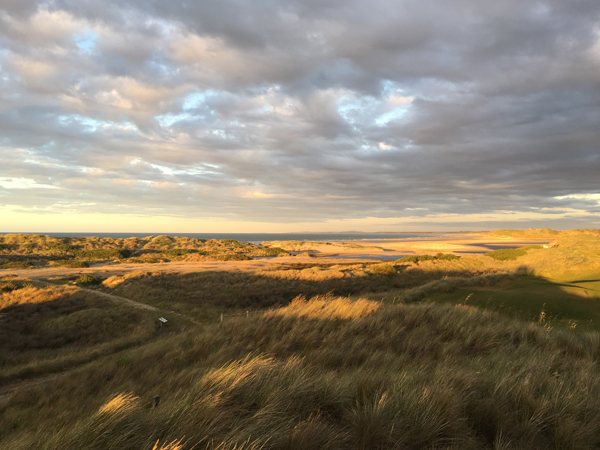 BARNBOUGLE DUNES GOLF TOURS … a unique golf experience! Day 3 of the Melville Glades golf tour of Barnbougle Links Resort and the 2nd round at the Lost Farm golf course has created some interesting scoring results. Kim McVicar’s 38 points topped the list of players, with young Kyle Smith and “pretty boy” John Rafala pressing hard with 36 points. 3rd & final round tomorrow with Kyle leading on 73 stableford points, followed by Andrew Smith & Steve Verkerk on 68. It should be a great final round at the Dunes with the winner being crowned the “Barnbougle” champion for 2015! Following the golf tomorrow, we head off to Melbourne airport with a transfer to Barwon Heads on the Bellarine Peninsula and two rounds of golf at Thirteenth Beach … the home of the Victorian Open! Will report again tomorrow from Barwon Heads! 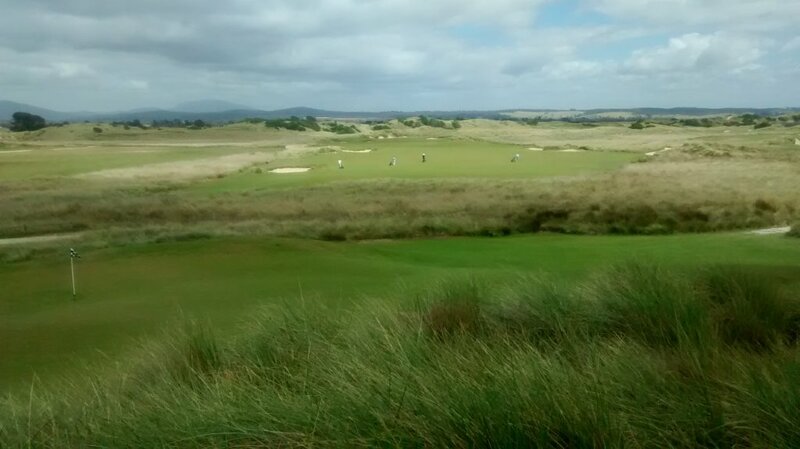 Day 2 of the Melville Glades golf tour of Barnbougle Links Resort and the 1st round of golf at the Dunes golf course. Great golfing conditions prevail with mild temperatures & gentle winds … something not experiences on last week’s tour! Some great scores reported … father & son Andrew & Kyle Smith score 37 stableford points each, with Andrew winning in a countback! Andrew shot 74 off the stick on his 3 handicap … what a golfer! Kyle is determined to turn things around tomorrow at Lost Farm … Steve Verkerk & yours truly not far behind with 34 points … stayed tuned for the next golfing results! Will report again tomorrow after the golf! Getting excited about visiting Barnbougle Links Resort again today, after a great couple of days there last week with a group of 16 golfers on tour. I have just met the golf group from Melville Glades Golf Club at Launceston airport this afternoon, and we are on our way to Barnbougle, which is 80 kilometres north east of Launceston. Our coach driver Reg is keeping the group entertained with local stories that may (or may not) be factual, but we are certainly in a fascinating part of Tasmania, driving through the picturesque Tamar Valley as the sun sets! A Welcome Dinner awaits in the Dunes Clubhouse tonight, and then “all day” golf at the Dunes tomorrow playing for a small pot, trophies & “bragging rights”! Weather conditions are changing and we may get some rain & wind … all part of the Barnbougle experience! 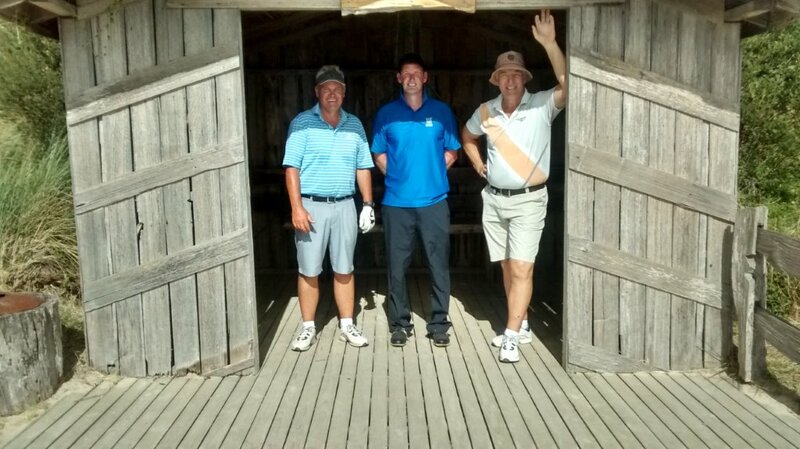 This golf tour was the creation of Melville Glades member Dennis Warburton, who was interested in playing the Barnbougle courses after hearing of the great links challenges from those who have been to Barnbougle previously. Dennis asked me to put the tour together, and 10 months later, here we are with 19 other members from the Club. Dennis is a scratch marker, so it will be interesting to see how he handles the conditions & course challenges. Dennis is also the official fines master for the group, so if he plays poorly, he will have his revenge in other ways! Warm weather comes early to Perth and brings the city to life and the golf courses to their beautiful best. Creating the ideal golf holiday itinerary for our guests is the number one priority of International Golf Specialists. Our visitors often marvel at the ease at which they can get around the city and its major attractions and, most importantly, the accessibility we provide to some of the finest golf courses in Australasia. We are blessed with Australia’s best climate and during our summer months golfers are able to choose tee times from 5.30am for the early starters, through to 5.00pm for these wanting a nine hole stroll before their evening activities. Our 3 night Perth golf package is an absolute classic, featuring a sensational line up of golf courses. International Golf Specialists make the perfect West Australian golfing holiday easy and hassle free. 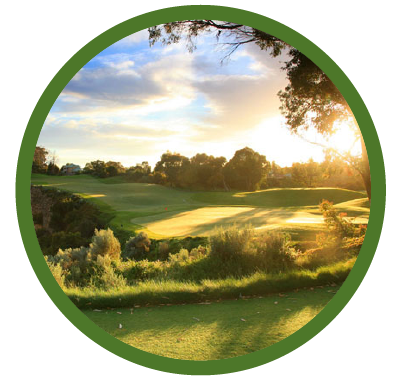 We have great rates at the best courses including Joondalup Country Club, Meadow Springs, The Vines and Araluen. Those golfers looking for a traditional links challenge will enjoy The Cut and Kennedy Bay. If you too want to experience these great courses and combine a fantastic golf holiday with everything else on show in Western Australia, speak to the guys of the Perth based team at International Golf Specialists today. Summer in Perth, Western Australia is Great Golfing! Strong relationships with the best golf courses and accommodation providers in Perth means International Golf Specialists can provide our inbound guests with tailor made itineraries specified to inpidual requirements and has seen us become the Number 1 Golf Tour Operator in Western Australia. Summer in Perth provides ideal golfing conditions. A morning round can take advantage of the cooler temperatures, leaving the rest of the day to explore everything on offer in Western Australia where an outdoor lifestyle is a direct reflection of how great this regions climate is. For those players who prefer a later tee time, the late mornings and afternoons are accompanied with a cooling sea breeze, just enough to make club selection a little trickier and always welcome to those looking forward to a cold drink at the end of the round. With summer just around the corner, now is a great time to speak to the guys at International Golf Specialists about your golfing experience in Australia’s West. The International Golf Specialists tour to Queenstown in March of 2016 will take in four of the best golf courses in New Zealand. Staying seven nights at the Novotel in Queenstown will provide our guests fantastic accommodation in the heart of this incredible town. The fine dining at the hundreds of restaurants and bars will accommodate for any taste and Queenstown simply buzzes with excitement 365 days a year. There is never a shortage of activities in and around Queenstown and people fly in from all over the world to experience everything this vibrant town has to offer. With two rounds of golf at the world renowned Jack’s Point plus rounds at Millbrook Resort, Arrowtown and Kelvin Heights, this tour will be one to remember. The golf and views throughout this region are stunning, with Jack’s Point located along the edge of Lake Wakatipu and providing amazing views out to the nearby Remarkables Mountain Range. An option of a round at The Hills Golf Club is one that some guests will choose to take up. This course is owned by New Zealand Jeweller Michael Hill and is a regular host of the New Zealand Open. Starting at just $2125, this tour represents great value and one that for first time visitors to Queenstown is sure to begin a lifelong love of the town and region. To book your place on this hosted tour, speak with the guys at International Golf Specialists for more information on all the options available on what promises to be a great golfing experience. New Zealand’s South Island offers a persity of landscapes and scenery that have provided the great golf course designers a natural canvas with which they have created some of the world’s most stunning courses. Queenstown in Central Otago is one of the world’s fastest growing golf holiday spots and the memories from this amazing region draw people back time and time again. The golf and hospitality are second to none and the views of the surrounding lakes and mountain ranges help to provide the relaxation and unwinding required by so many of our guests. Alpine golf at Terrace Downs in Canterbury provides incredible views through to the Southern Alps and the activities away from the golf course are many and varied. Those of us who choose to enjoy 18 holes of frustration surrounded by mother-nature are often inclined to partake in other outdoor activities. On any International Golf Specialists golfing holiday, we recognise that great golf is just one part of an itinerary. Familiarisation with the regions we send our guests to means we can recommend not only the best golf available, but activities that fulfil the requirements of all travelling players and partners. To begin planning your golf holiday to New Zealand or any of our other exciting destinations, speak to the team at International Golf Specialists today. The final day for the Williamson Group’s Perth 7-day golf tour! 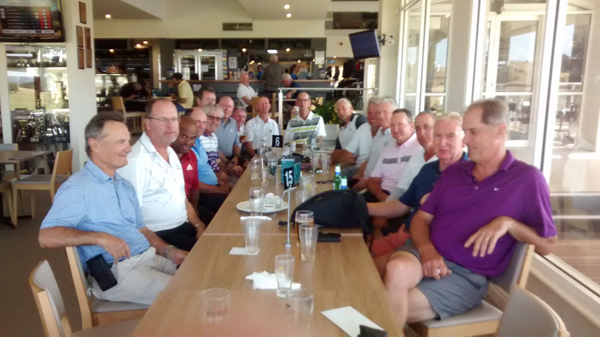 I saw the group off from Perth airport this afternoon, looking tired but satisfied that they had enjoyed a great golfing experience this week in Perth (see photo). They arrived in winter & departed in spring, and apart from a couple of rain showers, the group had clear skies and warm days … such is Perth’s weather patterns! There were daily and overall golf competition winners, however feedback was that all enjoyed this trip, with many planning to return with other golfing mates into the future. Group leader Leigh Williamson described the trip as one of the best ever, as he didn’t realise how good the quality of the Perth golf courses were. “Combine that with modern apartment accommodation and great restaurants & hospitality, overall it was a trip to remember for enjoyment and value”! Great golf in Perth is possible all year round, however with spring now here, and summer not far off, now is the time to be planning a Perth golf trip. Taupo, in New Zealand’s North Island, is a great place for a family holiday and with two world class golf courses, the perfect destination for a golfing getaway. Located along the banks of beautiful Lake Taupo, the town is home to around 25,000 people - many of whom are involved in the thriving local tourism industry. Watersports, skiing, fishing, sky diving, jet boating and para gliding are some of the activities enjoyed by visitors year round, and the incredible views of the lake and surrounding mountains draw people back time and again. Quality accommodation is available in the town. Ask the team at International Golf Specialists about our special rates with The Hilton chain of hotels throughout New Zealand. Wairakei International and the Jack Nicklaus designed Kinloch are must play courses for any keen golfer visiting the region. Both courses are superb, providing fantastic scenery and challenging golf. Wairakei is one of the best known courses in New Zealand and a round here blends the natural beauty of New Zealand and its wildlife into one of the best 18 holes of golf to be found anywhere in the world. Opened by the Golden Bear himself in 2007, Kinloch is a true test of links golf. A round here is always memorable with the undulating fairways, unforgiving rough and slick greens providing a challenge to players of all abilities. The stunning scenery at every turn will bring a smile to the face of all who love to experience the beauty of nature while wandering through 18 holes of relaxation, no matter how well or otherwise their round is playing out. Speak with the guys at International Golf Specialists for all your golf travel and corporate golf requirements. Playing Cape Kidnappers is a golfing experience I will never forget and one I would recommend to anybody planning a golfing holiday to New Zealand. The 8 kilometre drive in from the main road had me full of anticipation and there was nothing about the course, facilities or on-site accommodation that would disappoint. There were only a handful of other golfers playing on the afternoon that we teed off. On a busy day there may be 30. My playing partner elected playing from the back markers. Pride and the unrealistic expectation of my game on such a perfect day, didn’t allow me to suggest anything more sensible. Each hole at Cape Kidnappers is visually stunning, technically challenging and will leave even the most travelled golfer amazed at how course designer Tom Doak has blended golf and nature together so superbly. Perched on cliff tops 400 feet above the Pacific Ocean, the scenery and landscapes in this region of Hawkes Bay on the North Island’s East Coast are incredible and you will find that golf is all but forgotten between shots as you try to take in all the natural beauty on show 360 degrees around you. 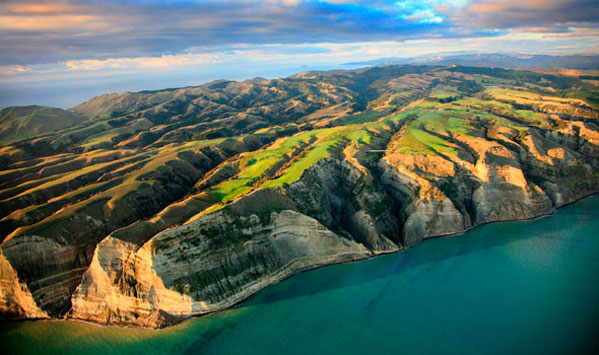 Cape Kidnappers is a must play for lovers of golf. I would recommend anyone planning a round here to play at least twice, as I am sure by the time their New Zealand golf holiday ends, they will wish they could play it just one more time. I know I certainly do. My recent site inspection trip to Vietnam in July, allowed me the opportunity to visit what will be regarded as one of the best golf courses in Asia in the years to come. 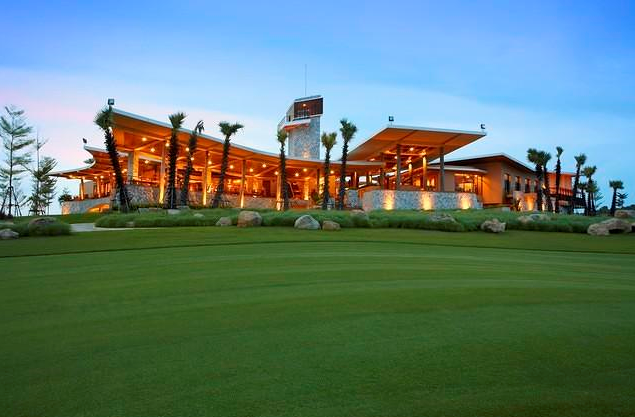 The Bluffs Ho Tram Strip opened in October 2014, and was designed by Australian golfing legend, Greg Norman. A true links-style golf course, The Bluffs is routed over and around towering sand dunes, which have been shaped over thousands of years by the elements. The wind plays a major role in the experience here … it's always strong, and its prevailing direction differs depending on the time of year. The Bluffs Ho Tram Strip is one of the few championship-calibre links courses with significant elevation changes, making for a golf experience that's as much a feast for the eyes as it is a challenge to tame. While the highest point of the property is only 50 metres above sea level, one of the most spectacular spots comes earlier in the round, on the 4th hole. From there, players are presented with a 360-degree view of the course, of the surrounding national forest that's a haven for wildlife, of the expansive shoreline and of The Grand Ho Tram Strip, which opened in July 2013 as Vietnam's first international luxury casino resort. "This is one of only two pieces of land of this quality and character I have ever been given to work with -- the other being Doonbeg [in Ireland]," Norman said. “I’m a firm believer in using what Mother Nature gives us on a particular site. This one has it all." The Bluffs Ho Tram Strip is an easy 2 hour drive from Ho Chi Min City, however to make the most of the visit to The Bluffs, it is recommended to stay a night or two at The Grand hotel resort. Ho Tram Strip’s first luxury integrated resort is drenched in tropical sunshine and bordered by the untouched beaches fringing the East Sea. Combining elegant and gracious service with top level entertainment, The Grand Ho Tram Strip is the perfect mix of exciting day life and exhilarating nightlife. No golfing holiday to South Vietnam would be complete without a visit to The Bluffs Ho Tram Strip. It is a “must play” golf course, and you will be disappointed if you don’t schedule more than one round there. The Bluffs features in our Vietnam golf packages and exclusive 2016 tours … for more information about a great golfing experience in Vietnam, contact the team at International Golf Specialists for a tailored and memorable golf holiday. Bali Golf Travel - An Experience to Remember! Every golfers delight, Bali is the ultimate golf destination. Enjoy the exotic beaches, play at the championship golf courses and stay in first class golf resorts in this golf paradise. Playing golf in the picturesque settings of the ‘Island of the God’ is a heavenly experience and it is a pilgrimage for the golfing community. Get an amazing golf experience among the lush greens with breathtaking landscapes, natural hurdles of gorges, lakes and sand bunkers. Excited? Bali offers a memorable golf journey for the ones who cherish the good things in life. Explore deluxe golf courses at this landmark destination that is just not to be missed. Play among well manoeuvred fairways that you have never seen before and experience luxurious bliss. Among a host of resorts that offer a world-class golfing experience, Bali National is the utmost and has been rightly named the ‘King of Bali Golf’. Visit this celebrated golf course and feel the magic. Having spent a day in this superb golf course is an experience in itself. There are many other remarkable and lush green courses in Bali too. The Bali Nirwana Golf Course is a classical resort that gets golfers from the world over, while the New Kuta Golf Club offers the complete golf experience. Get a truly enchanting feel playing in the crater of an extinct volcano at the Bali Handara Country Club which is an 18-hole golf course. For the ones looking for some value for money options, the 9-hole Bali Beach Golf Course is an ideal destination. 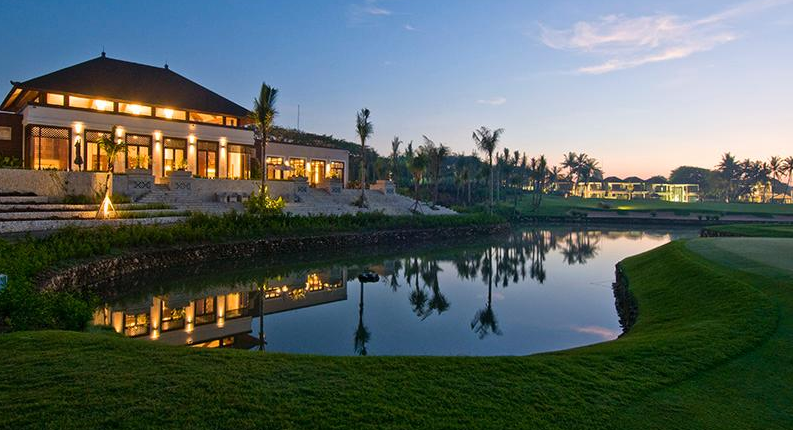 Great golf comes naturally to Bali and this golfer’s haven has on offer nothing but the best. Plan your next golf holiday in the wonder land of Bali and you will not regret it. Create memories for life! I visited the city of Da Nanag in Vietnam recently as part of a site inspection trip of the Southern & Eastern Vietnam golfing regions. And what an impressive destination it is! Da Nang is a vibrant port city with beautiful beaches, spectacular mountains and large rivers and bays that make for a visual treat for tourists and locals alike. There are three international standard golf courses within easy reach of the city, and a new mountain resort course, Ba Na Hills, designed by Englishman Luke Donald to be opened in April 2016. 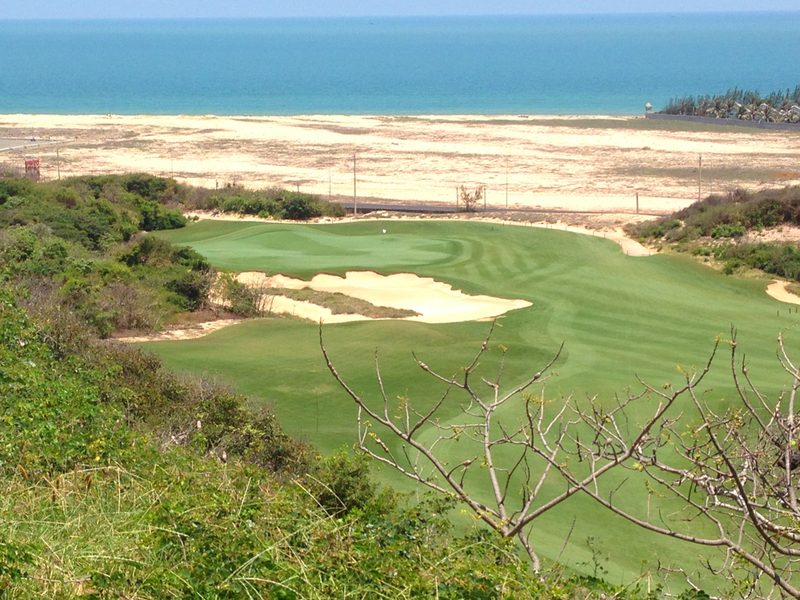 Danang Golf Club is the premier course of the region. 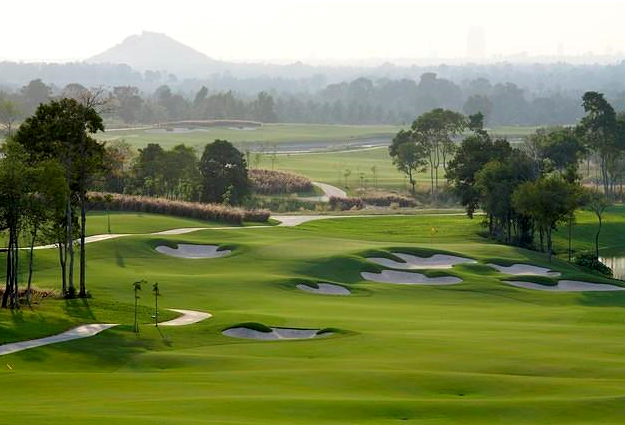 Designed by Australian Greg Norman, this course was awarded best Golf Course in Vietnam – 2013! The Dunes course is situated on the coast amid 150 hectares of dunescape similar to what the world’s first golf courses were carved from. Its chief feature is a 7,160-yard, 18-hole, links-style layout that was designed in the true spirit of the game — blown-out bunkers, firm and fast fairways that bleed gently into wild seaside vegetation, rugged waste areas, swales and hollows. It lies in close proximity to two of Vietnam’s most historic destinations — UNESCO World Heritage sites Hoi An and Hue — and offers breathtaking views of the Marble Mountains, East Sea and Cham Islands. Virtually next door to the Dunes course, is the impressive Montgomerie Links. Montgomerie Links is located midway between Hoi An and Danang, and is just 15 minutes’ drive from Danang International Airport. Eight-time European Order of Merit winner and 2010 Ryder Cup-winning captain, Colin Montgomerie, designed the beautifully presented links-style course. 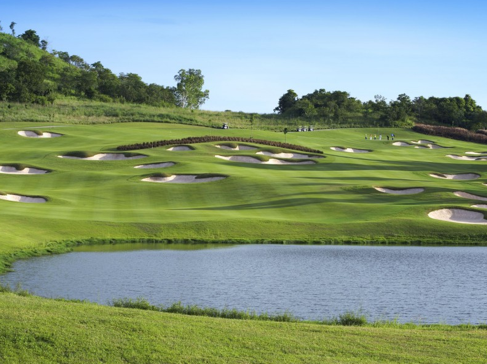 The 2012 Forbes Travel Guide rated Montgomerie Links as one of Asia’s ten most elite courses. Although the course doesn’t officially have a signature hole, the stunning par-5 12th is truly memorable. Playing slightly uphill to a bunker-riddled fairway, the hole is framed by the clubhouse in the background and has been described as the best par-5 in Vietnam. 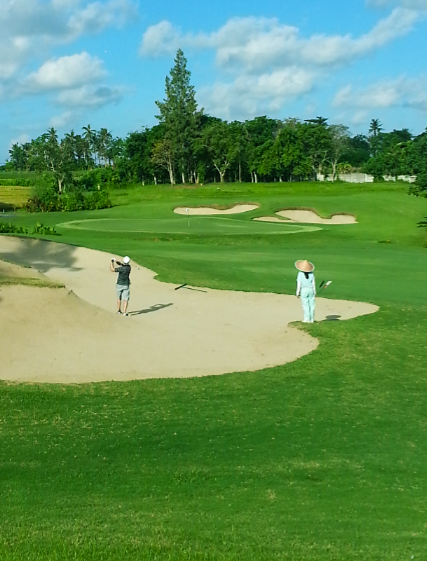 Another golfing treat is Laguna Lan Co Golf Club. A pleasant 45 minute drive north of Da Nanag is the Laguna Golf Club, integrated into the Banyan Tree and Angsara resorts. An 18-hole, par-71 championship course designed by Sir Nick Faldo, the course delivers a golfing experience that can be enjoyed by the most experienced players and beginners alike. Voted “Best new course Asia Pacific” by Asian Golf Monthly in 2013, this is a very strategic golf course that rewards good ball-striking, but can punish the wayward strokes. A calming sea breeze wafts across the course, which offers ocean views and an amphitheatre-like mountainous backdrop. The course weaves between trees, natural streams, over rice paddies and through impressive rock features to create a memorable, perse and unique golfing experience. 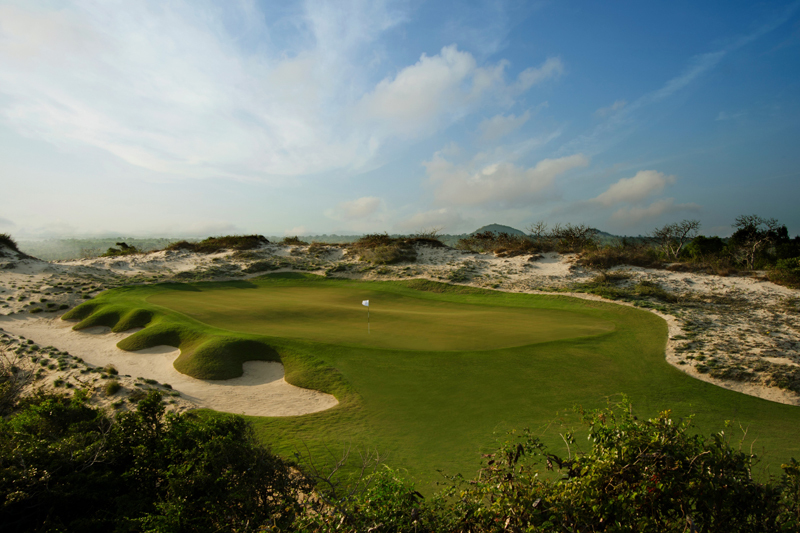 Da Nanag is the premier golfing destination in Vietnam. With four international standard courses open for play in 2016, no golf trip to Vietnam would be complete without a visit to this region. Presenting our new promotional video, featuring all of our different destinations. This video includes photographs from Thailand, Malaysia, Bali, Western Australia, New Zealand, and Vietnam. Have any questions about our destinations? Don't hesitate to contact us now with any questions! I recently visited Thailand as a guest of Golfasian … the leading golf tour operator in South East Asia and now a partner of International Golf Specialists. I completed site inspections of a number of high quality golf courses, however one that really impressed was the Plantation Course at Siam Country Club in Pattaya. 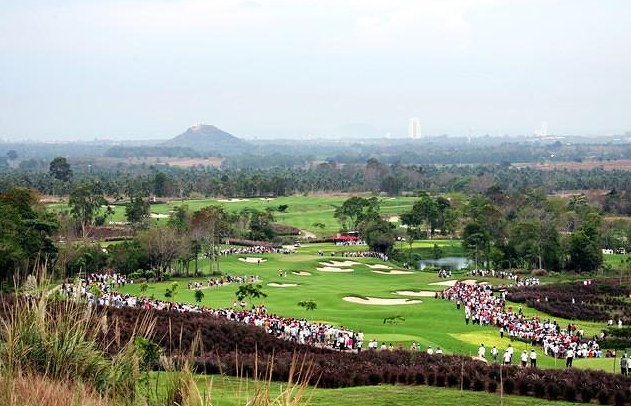 This course has just hosted the 2015 Thailand Open, won by South Korean professional, Kim Kyungtae ended a frustrating three-year wait for victory. Kim claimed the Thailand Open after a thrilling head-to-head battle with his young compatriot Wang Jeung hun. Kim, better known as “KT”, shot a seven-under-par 65 on the Plantation Course at Siam Country Club to beat Wang by three shots and finish with an impressive winning total of 21 under. Wang fired a 67 in the US$1 million event jointly-sanctioned by OneAsia and the Japan Golf Tour Organisation. Australian Josh Younger, the leader at the start of the day, returned a 73 to claim sole possession of third place four shots further back. There is some many great golfing events being staged around the world, it is sometimes difficult to keep up with the results. This week is the start of the 2015 US Open Championship and will be the 115th U.S. Open, scheduled to be played June 18–21 at Chambers Bay in University Place, Washington, southwest of Tacoma on the shore of Puget Sound. There are 6 Australians in the field … Adam Scott, Jason Day, John Senden, Marcus Fraser, Marc Leishman and Geoff Ogilvy. Let’s hope the Aussies give a good account of themselves at the very challenging Chambers Bay course. I am currently travelling around Thailand as a guest of Golfasian, the leading golf tour operator in South East Asia. I am completing familiarisations and site inspections of the best golf courses and resorts in the country. I have visited Black Mountain, Banyan Tree and Springfield at Hua Hin in the south of Thailand, as well as Siam Country Club, Laem Chabang and Thai Country Club at Pattaya. The Plantation course at Siam Country Club is hosting the 2015 Thailand Open next week, and was being set up for that event when I visited. The Old Course is home to the Honda USLPGA event in 2016. I also visited some great golf courses near Bangkok. Nikanti Country Club is a brand new “6 star” private golf club that has opened to rave reviews … awesome stadium type course that will host major tournaments into the future. 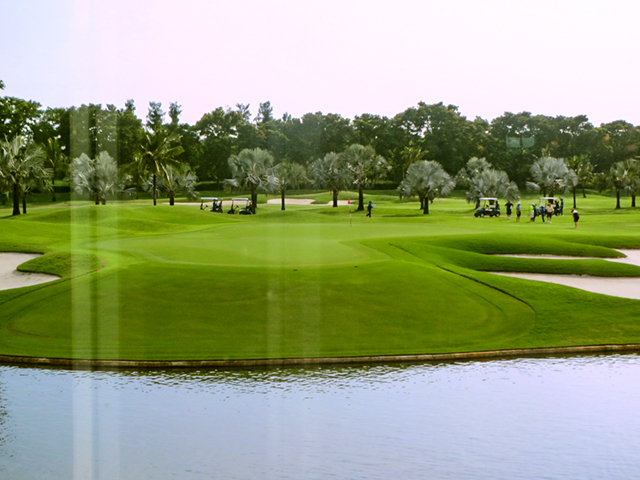 Suwan Country Club is a more traditional golf course that has hosted many tournaments including the 2013 Thailand Open. Lots of water carries and large undulating greens, make this a challenging and picturesque golf experience. The magical Kingdom of Thailand is one of the best destinations for a golfing holiday. From great golf courses to the cultural experience of the Thai people, its weather, cuisine and bustling lifestyle, this is a golf trip to dream about and to plan future trips around. For more information about a great golfing experience in Thailand, contact the team at International Golf Specialists for a tailored and memorable golf holiday. 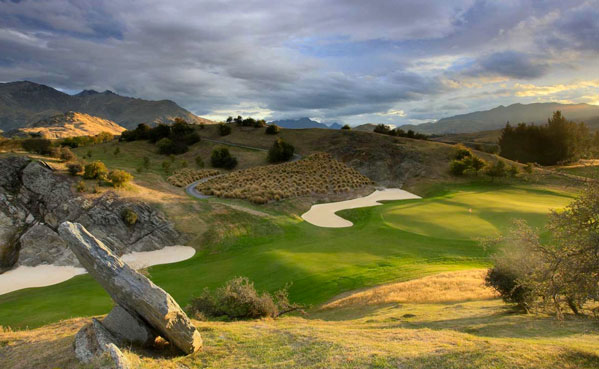 New Zealand offers the golf traveller some of world’s greatest golfing experiences. With almost 3 million people visiting her shores each year, New Zealand is fast becoming one of the most exciting golf destinations in the world. 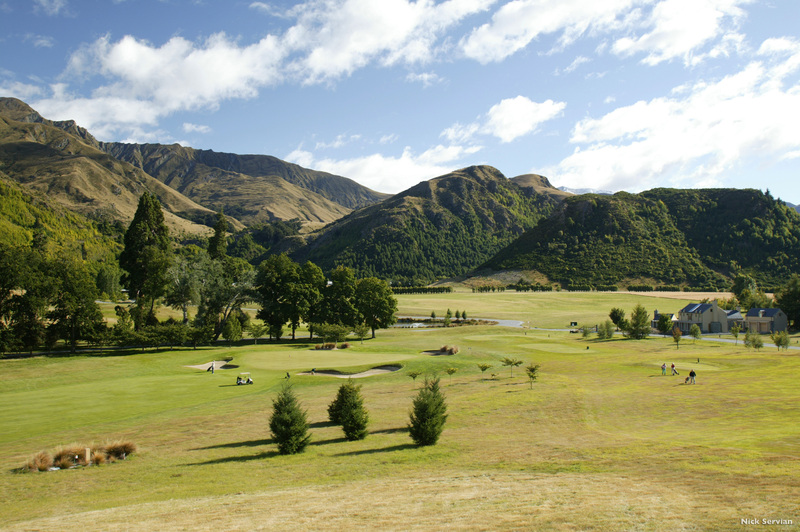 Both the North and South Island offer golf courses as stunning and diverse as the country itself. Kauri Cliffs in the far north and its sister course Cape Kidnappers in the Hawkes Bay, are world renowned and offer an unforgettable golfing experience. The town of Taupo in the middle of the North Island boasts Wairakei International and the Jack Nicklaus designed Kinloch, the latter being a true test of links golf and one the Golden Bear rates amongst his finest creations. 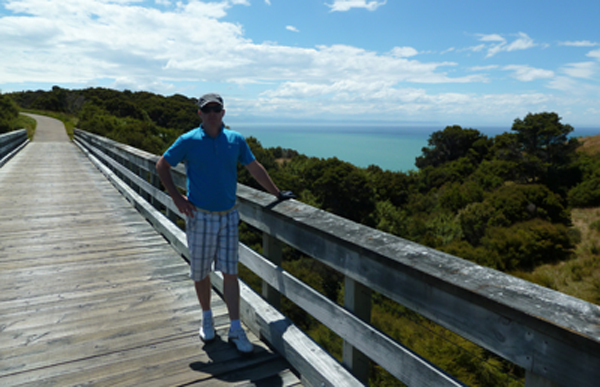 To the South Island where both the golf and scenery are simply incredible. 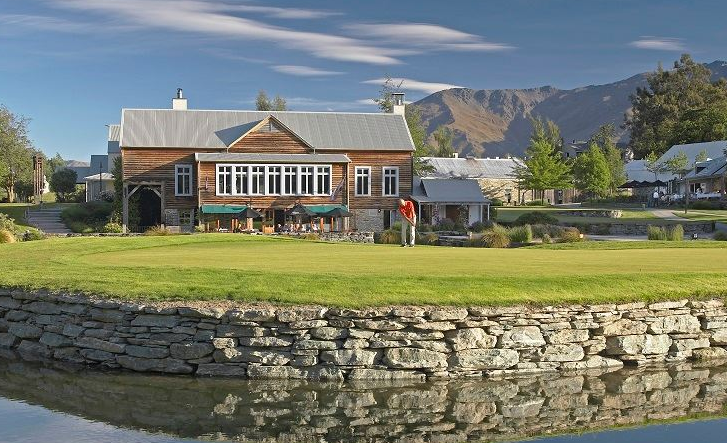 In Queenstown the courses of Jacks Point, The Hills, Millbrook, Arrowtown and Kelvin Heights mean visitors here are guaranteed a huge variety of golfing experiences, all of which are located within a short drive of each other. 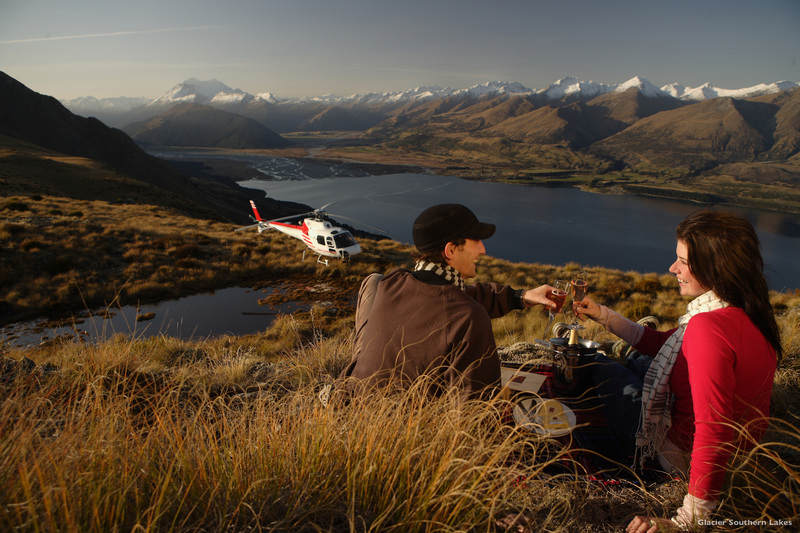 After each round, the activities in and around the Queenstown region will satisfy every requirement. Fine dining, adventure and adrenalin sports, wine tasting and gold panning are just a few of the many offerings in this incredibly exciting destination. To arrange your New Zealand golfing experience, speak to the team at International Golf Specialists today. 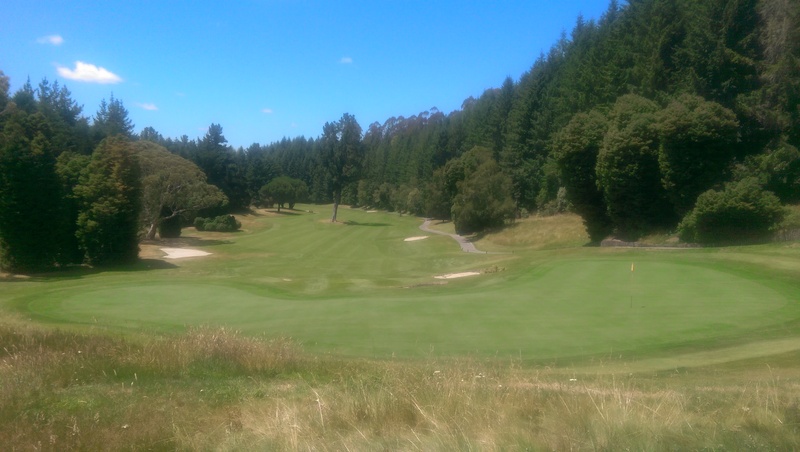 The recent International Golf Specialists tour of New Zealand’s lower and central North Island took in some sensational golf. New Zealand turned on incredible weather for the 6 days we were there and the diversity of stunning landscapes was matched by the many amazing golfing experiences we had along the way. 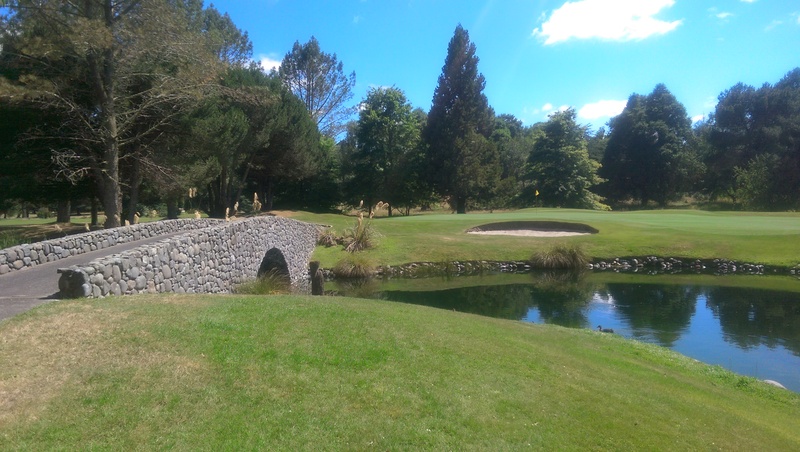 The last round of the trip was at the world renowned Wairakei International, a must play for anyone visiting the North Island, but we learned along the way that New Zealand can provide a treat to golf adventurers at every turn. With a spare day set aside for travel through to Taupo and being a few hours ahead of time, we decided to make an unscheduled stop as we drove through a small country town called Piopio. What caught our attention in this town of only 670 people were the lush green fairways running alongside State highway 3 as we drove through this ‘blink and you’ll miss’ it settlement. One U turn and ten minutes later, we had paid our $20 green fees in the honours box and were standing on the first tee. ‘If you’re going to miss the green, miss short’, was the advice from a friendly local before we teed off. Well advised too and we could have well done with more local knowledge throughout our round. The 18 holes around this country course were extremely memorable and highly challenging. We had all paid a lot more and had much less of a golfing experience in the past. Its elevated greens, thick rough and blind tee shots tested every aspect of our games and the many hills, throughout the front nine in particular, our physical fitness. Just as the scenery throughout this spectacular country is ever changing, so are the options for a golfing adventure, and with more courses per head than anywhere else in the world, a New Zealand golfing getaway is one that you will long remember. 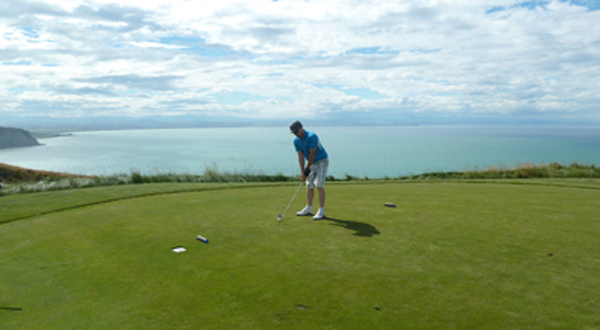 To begin planning your New Zealand golf holiday, speak to the guys at International Golf Specialists. MAURITIUS … “AN INDIAN OCEAN GOLFING PARADISE”! In the 19th Century, under British rule, Mauritius became the third country in the world to be introduced to golf. 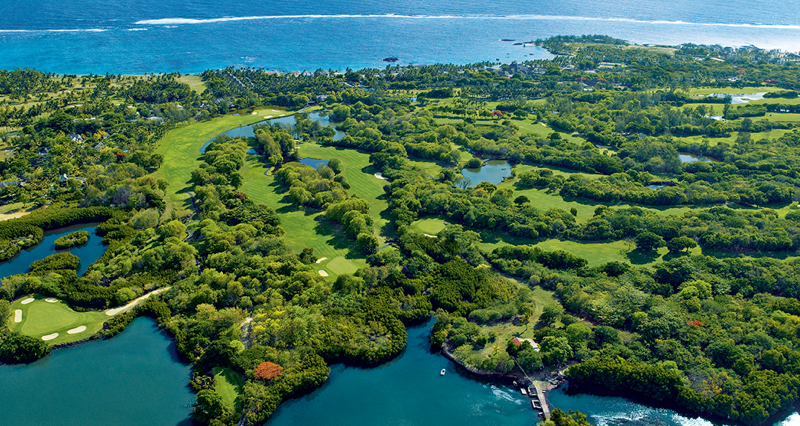 Since that time, Mauritius has been evolving as one of the best golfing destinations in the world. Mauritius hosts nine 18-hole golf courses and five 9-hole golf courses, each of which provides a unique golfing experience to the visitor. With its natural beauty, good climate and unique cultural blend, Mauritius is an island with so much to offer … great golf is one of them! In 2008, the island was awarded the title of Golf Destination of the Year – Africa, the Indian Ocean and the Gulf States – by the International Association of Golf Tour Operators (IAGTO). Here, the visiting golfer has the chance to practise their favourite sport in optimal conditions on spectacular golf courses, located on beautiful sites with the Indian Ocean as a backdrop. Many of the golf courses have been designed by prestigious players such as Bernhard Langer, Ernie Els, Gary Player, Rodney Wright and Hugh Baiocchi. The Legends & Links courses of the Constance Belle Mare Plage resort plays host annually to the European Senior tour event, the MCB Tour Championship during 12- 14 December. Ian Woosnam and David Frost. What a great golfing event to build a Mauritius holiday around. Air Mauritius flies 3 times a week from Australia to Mauritius using modern Airbus A320 aircraft with two class configurations. Departing Perth at lunch time and arriving at your Mauritian resort in time for dinner is a great way to start your Mauritian golfing experience. Contact International Golf Specialists for more information about Mauritius golf holidays. 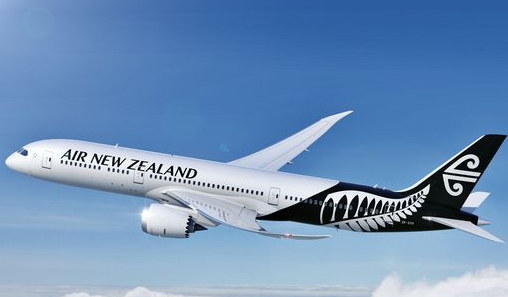 With the introduction of a 787 Dreamliner for the Perth – Auckland route, Air New Zealand has made the direct flight across the Tasman an absolute pleasure and the new Boeing jet comes with features never before seen in air travel. Importantly, for a journey of between 6 and 7 hours, the seating is extremely comfortable, not once did I find myself turning in my seat, trying to find a more comfortable position as I so often do on other planes. The inflight entertainment system has movie, TV, music and games selections to satisfy everyone flying, and for those wanting to watch their own shows, a USB port below the screen means you can plug in your own portable device. There is even a charging socket in each seat which ensures the battery on your laptop or mobile phone will be fully charged when you land. Ordering meals and beverages on board has never been easier. Simply open the food and drinks menu on your screen, select what you want and the order is sent directly to the crew who deliver straight to your seat. The meals and drinks are of the typically high standard associated with Air New Zealand and the service from the crew members seems to be a cut above, which may be a reflection of their pleasure in working on-board such a fine aircraft. The 787 also has Skycouch which gives travellers the option of purchasing three seats together and converting them into an area where they can lie full length for the duration of the flight. Perfect for couples or those travelling with children. My latest trip to New Zealand was made so easy by Air New Zealand that I will be increasing the frequency of my visits. The smooth flights with surprisingly quick travel times and the fact I suffered none of the usual side effects of a relatively long trip aboard an aircraft has sold me on the 787 and it is a plane that I look forward to travelling on again. Contact the team at IGS today to book your next New Zealand golf experience! The magnificent Nirwana Bali Golf Course is situated within the Pan Pacific resort complex and a leisurely round here normally takes around four hours. Personal caddies providing accurate information with club selection and putting lines make playing here hassle free. Nirwana is such an amazing course, it alone will be enough to bring golfers back to the Island of Bali while the buzz and excitement of the shopping areas in nearby Seminyak keep those wanting to shop, enjoy some of the local cuisine or a relaxing massage, occupied for most of the day. 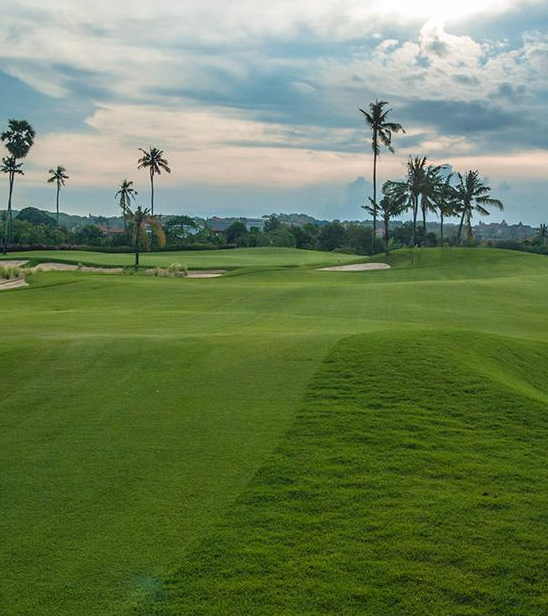 Located just 20 minutes from the airport, New Kuta Golf Course has hosted the Indonesian Golf Open and provides a truly challenging test of golf for players of all abilities. With options of five different tee positions and the courses location overlooking the crystal clear waters of the Indian Ocean, New Kuta can play completely differently from one day to the next. This course is another fantastic Bali golf treat. The huge selection of nearby hotels will offer even the most discerning golf traveller an abundance of accommodation options. A Bali golf holiday will not disappoint – on or off the course. Talk to International Golf Specialists today to begin arranging your next hassle free golf holiday. Our Bali golf packages offer priority tee times, discounted rates, accomodation & more. All tours and packages can be custom fit to suit. There are very few visitors to New Zealand who ever leave ‘The Land of the Long White Cloud’ disappointed and the same is true about those who treat themselves to a golfing holiday in this amazing part of the world. Golfers are spoilt for choice with destinations in New Zealand and whether you want to stay in one spot and enjoy all a particular region has to offer on and off the golf course, or experience the perse landscapes and golf on offer in other parts of the country, New Zealand can provide you with the perfect golfing holiday. The ever popular Queenstown region offers so many activities and some of the best golf courses in the world, all within a ten minute drive of each other. The Hills, Jacks Point, Millbrook and Kelvin Heights are all remarkable courses and provide some of the most spectacular vistas to be found anywhere on the planet. 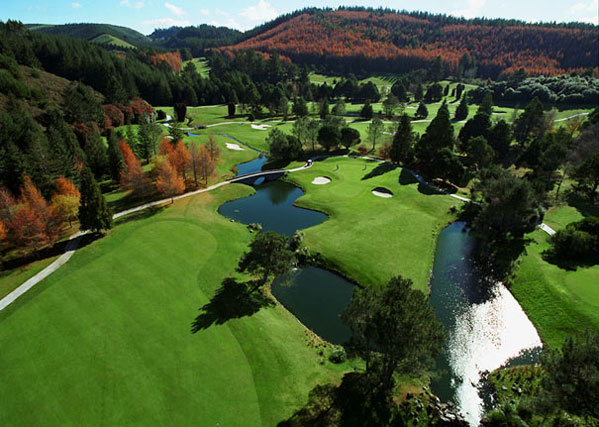 The Taupo region in the North Island is home to the Jack Nicklaus designed Kinloch and Wairakei International. These two courses alone will make a journey from any part of the world seem worthwhile. Just a two hour drive from Taupo is the incredible Cape Kidnappers. Ranked at Number 38 in the World’s Top 100 Golf Courses, its fairways wind along cliffs tops to greens perched 400 feet above the Pacific Ocean with views out to the magnificent Hawkes Bay. The main centres of Auckland and Wellington offer a huge range of culture and persity as well as many of the top ranked courses in the country. Paraparaumu Golf Club and Royal Wellington in the nation’s capital and Titirangi in Auckland are perfect courses to begin or end any golf holiday to New Zealand. To make your New Zealand golfing dream a reality, contact the team at International Golf Specialists today. Australia offers so much to the golf traveller and is world renowned for its great golf courses, vibrant cities and laid back lifestyle. Where are some of the best golfing destinations in Australia … here are a couple of our favourites! 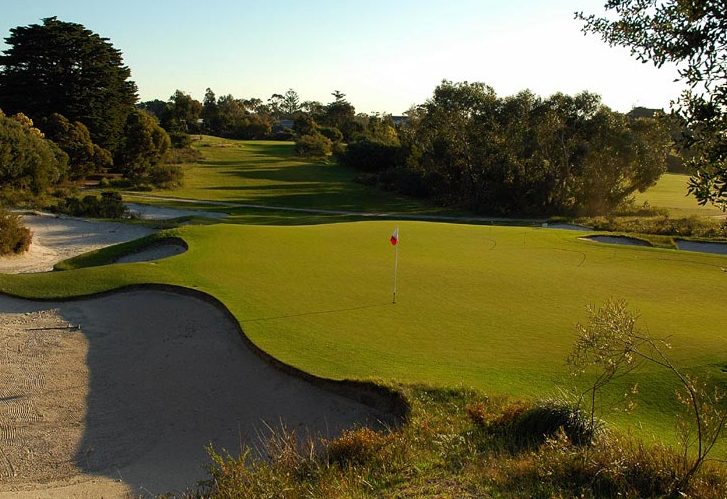 The mighty sand-belt region of Melbourne offers some of the best and challenging golf courses in the world. 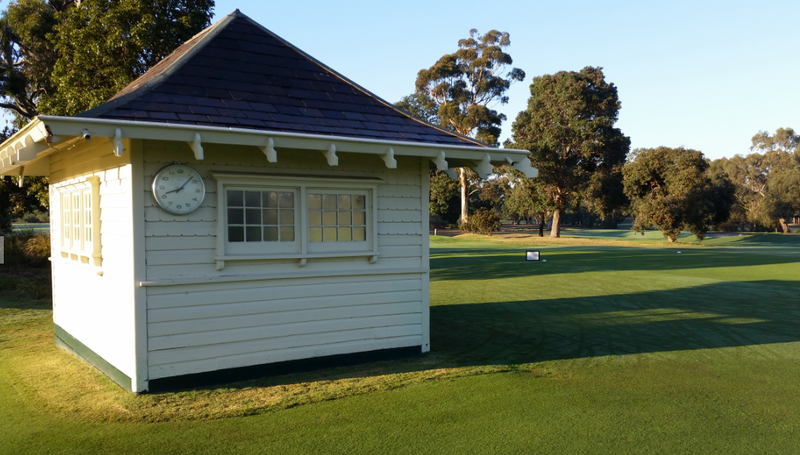 Courses such as Royal Melbourne, Kingston Heath and Victoria are all rated as world Top 100 courses and offer year round playability. Getting on these prestigious courses is the tricky part, as they are private golf clubs, however some access is provided through reciprocal and golf tour operator arrangements. Alternatively, a trip to the Mornington Peninsula just a one hour drive away is a great golfing experience at many top notch public access courses. The National Golf Club at Cape Schanck has three excellent golf courses. The ‘Moonah’ (Greg Norman), the ‘Old Course’ (Robert Trent Jones Jnr.) and the ‘Ocean’ (Thomson, Wolveridge & Perrett), are three magnificently designed, world-class, championship courses currently ranked within the Top 100 courses in Australia. 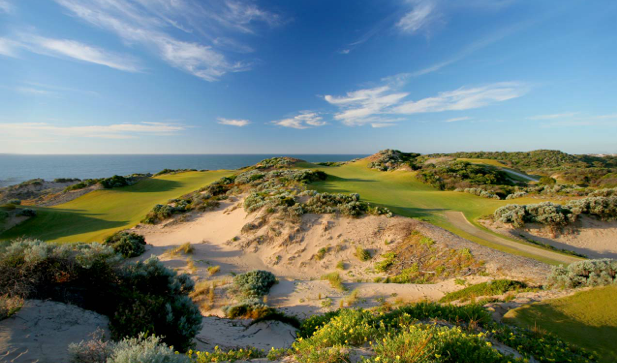 The Dunes and St Andrews Beach are also “must play” Mornington Peninsula championship courses with top designers such as Tom Doak and Tony Cashmore. Hop across the Bass Strait into Launceston, Tasmania and make the one hour leisurely drive to the spectacular golf precinct of Barnbougle Dunes. Two 18 holes world-rated courses, The Dunes and Lost Farm await your golfing delight. Recently rated #11 & #23 in the world Top 100 courses, you will be beguiled by the natural beauty of these links courses … straight out of the greatest links courses of Great Britain … but only 10 years old!!! You will be finding a reason to stay a little longer and play these courses over again! If you are a keen golfing enthusiast, like to travel, and enjoy some luxury at your destination, then Mauritius is for you. Great international standard golf courses and beautiful resorts await you in Mauritius … only an 8 hour direct flight from Australia. Flying 3 times a week from Perth, using modern Airbus wide body aircraft, you can leave Perth at lunchtime and be enjoying your evening meal in one of the many five star resorts that Mauritius is renowned for. A good night sleep and you are ready for any of the many internationally acclaimed championship courses in Mauritius. A recent Australian Golf Digest edition has rated Perth, Western Australia as one of the leading golfing destination in Australia. After Karrinyup comes Joondalup Country Club at #17; Links Kennedy Bay #23 and The Cut at #35. That’s 4 Perth courses rated in the top 40 in Australia. Other top notch public access golf courses are Meadow Springs (designed by Robert Trent Jones Jnr); Araluen Country Club and the Vines Resort. International Golf Specialists can arrange Perth golf packages and tours around events such as the Perth International where you can watch some of the best professional golfers in the world … and then go and make your own golf magic happen. Great golf in the West! International Golf Specialists has received a lot of recent enquires for golf packages and tours to Western Australia. It seems that the staging of the Perth International golf tournament at Lake Karrinyup Country Club for the 3rd consecutive year has created real interest in this event which has grown in terms of importance and popularity for touring professionals from all the major PGA tours. Combine that with great spring weather and a range of other top quality public and private golf clubs has really put Perth on the “bucket list” golf trip for Australians and overseas visitors. Weather in Perth in October is usually superb, with warm days and mild nights, and plenty of sunshine for those memorable games of golf. Course such as Joondalup Country Club, Vines Resort, The Cut and Meadow Springs provide an incredible variety of international standard, championship golf courses. International Golf Specialists can arrange Perth golf packages and tours around the Perth International where you can watch some of the best professional golfers in the world … and then go and make your own golf magic happen. 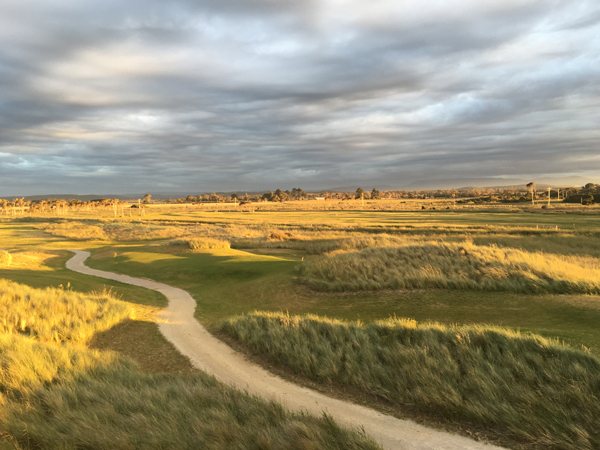 BARNBOUGLE DUNES … THE ULTIMATE GOLFING EXPERIENCE! Barnbougle Dunes is an amazing golfing destination, located 50 kilometres north east of Launceston, Tasmania just near the seaside fishing village of Bridport. There are two purpose built links courses, the older Dunes course and the newer Lost Farm course. Both are constructed within and around the sand dunes of the Forrester River, and sit adjacent to Bass Strait. Both courses have famous American designers, Tom Doak (Dunes) and Bill Coore (Lost Farm) and are designed on the lines of the famous British and Irish links courses. The Dunes is only 9 years old, but looks like it has been around for a hundred years. The Dunes course is Golf Digest #1 Public Access course in Australia … Lost Farm is #2! Despite the close proximity of the courses, they are remarkably different. The topography of the land on which the Dunes lies rolls in and out of the sand dunes along the coast, whilst the sand dunes on which Lost Farm lies are steeper and more dramatic. The Lost Farm plays along the coast and inland and also features 20 holes. Which course is better? – that will depend on which way the wind blows and to some extent how you play on the day, so we’ll leave that for you to discuss over a few quiet drinks at the clubhouse. In addition to the golf, there is a world-renown wine precinct within the Tamar Valley, with wineries such as Pipers Brook, Janz and Ninth Island producing world standard wine, with top class restaurants and wine cellars. A wonderful wine touring trail has been developed and was rated as one of the “Top 10 Wine Routes in the World” by Essential Travel magazine (UK), June 2011. 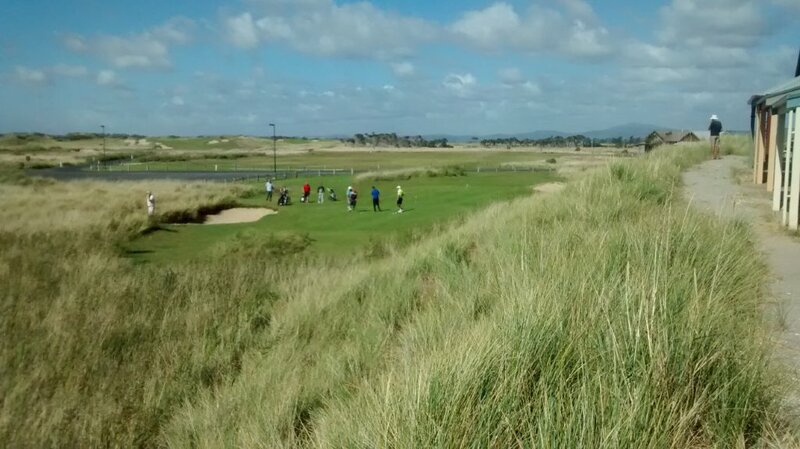 We have great rates and contacts at Barnbougle Dunes, so why don’t you join an International Golf Specialists group tour, or let us prepare a specialised itinerary for you & your golfing mates and enjoy a “great golfing experience”! IGS offers some amazing Tasmania golf packages & Barnbougle Dunes golfing experiences. A Bali golf holiday will not disappoint – on or off the course. Talk to International Golf Specialists today to begin arranging your next hassle free golf holiday. Sabah is often referred to as ‘Malaysian Golf Holiday Heaven’ and provides great golf courses with an emphasis of providing a variety of playing experiences. Accommodation at one of the luxurious hotels and resorts in the city of Kota Kinabalu ensures easy access to some of the best golf courses in Malaysia. Sutera Harbour Golf and Country Club has 27 holes, some of which line the beach where fairways merge into the sand and gentle waves of the South China Sea roll in. Sutera Harbour also has an option of night golf with nine holes floodlit for those wishing to play after dark. 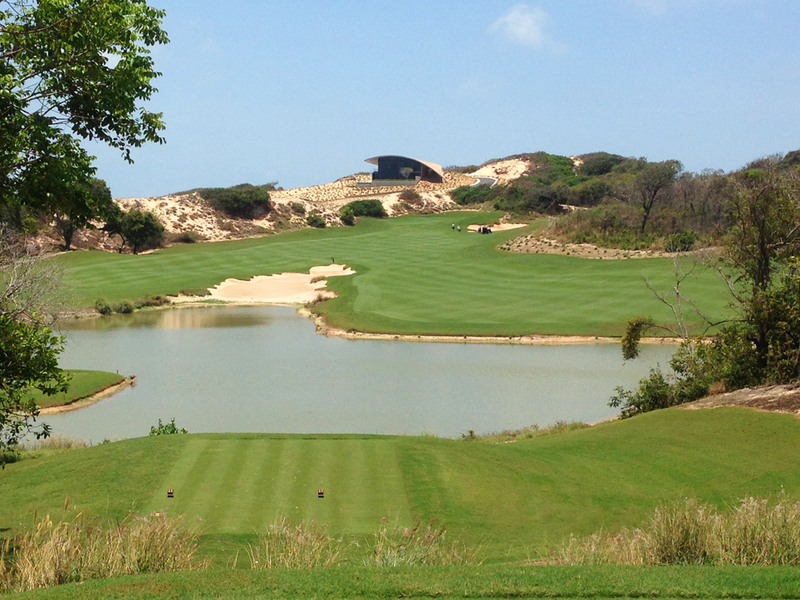 Graham Marsh has designed a challenging and beautiful course which, for guests staying at the nearby Sutera Harbour Resort, is a short stroll away from their luxurious accommodation. Dalit Bay Golf & Country Club is ensconced within the 400 acres of Shangri-La’s Rasa Ria Resort, a leisurely one hour drive north from Kota Kinabalu. This superb 18-hole championship course designed by Australian Ted Parslow, provides a stimulating and uplifting playing experience. Bordered by the Tambalang and Mengkabong rivers with a stunning vista of Mount Kinabalu in the distance, Dalit Bay is a prime wetland course where water comes into play at every hole. The course is maintained in excellent condition year round, and has modern and comfortable Clubhouse facilities to ensure your game of golf is well rewarded. Nexus Golf Resort is a gem, stretching 6,063 metres between the hilly interior and a picturesque beachfront with fantastic course conditioning and turf maintenance. The layout starts off inland then plays alongside the beachfront from holes 3 to 5 with Mt. Kinabalu as the backdrop and 12 landscaped lakes that affect play. As well as offering spectacular scenery, many of Sabah’s golf courses are equipped with the best facilities and amenities to be found anywhere. With courses providing fantastic club rooms and facilities plus options of other activities such as racquet sports, tennis and fishing, an International Golf Specialists (IGS) golf holiday to Sabah can provide so many great experiences both on and off the golf course. To begin planning your Malaysian golfing experience, speak to the team at IGS about arranging your holiday to the amazing golf courses and accommodation in beautiful Sabah. Phuket is not just a destination for recreational travelers. 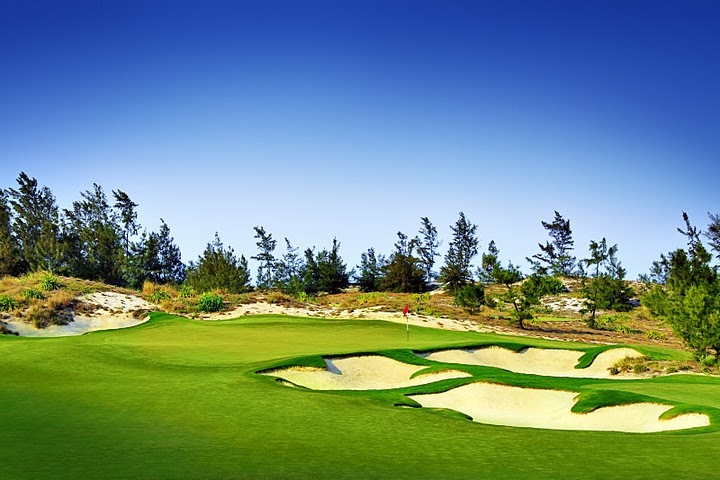 World-class golf courses also make the island a golfers' paradise. The golf courses in Phuket offer stunning landscapes and challenging playing experiences for beginners and expert golfers alike. IGS provides you with an unrivalled choice of golf packages combined with luxurious and first-class customer services. When you are seeking a memorable golfing holiday on championship golf courses, IGS is a one-stop-shop that will cater for all your requirements, especially with our discounted golf packages. Phuket has hosted some of Asia's biggest golf tournaments at the prestigious Blue Canyon Country Club Courses. Other Phuket courses such as Loch Palm, Red Mountain, Phuket Country Club, Laguna Phuket golf course, and Mission Hills Golf Resort & Spa also meet high international golfing standards. We can book your preferred tee-off times at any one of these spectacular and challenging courses. IGS can also arrange your accommodation, from multi-level luxury hotels in Phuket to rental villas and apartments, suiting your budget and preference. 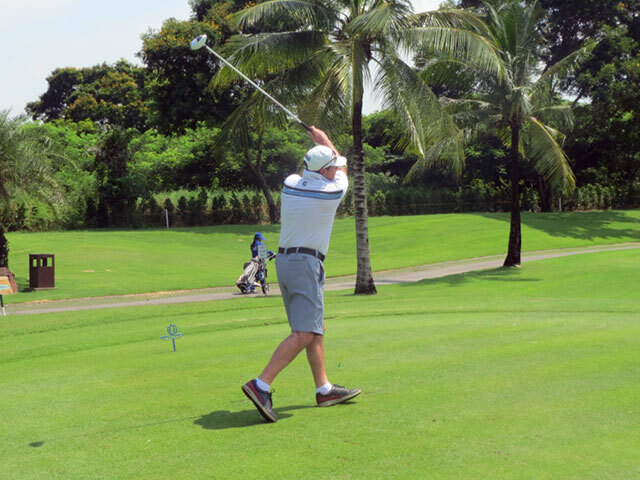 In February, I played at Nirwana Bali Golf Club for the second time. I had actually contemplated not taking the opportunity to play this magnificent course again and very nearly didn’t take my golf clubs. The free day I had in the middle of the week there for a business conference was going to be spent exploring other parts of the island, but the golf tragic in me ensured I had the golf shoes packed in my case before most else. Arriving into the warm, tropical Bali climate made me realise that I had made the right choice by bringing my clubs with me and I couldn’t wait to have another crack at the world class, Greg Norman designed course. The work days seemed to drag and I couldn’t wait for my 8.30 am tee time on the Wednesday morning. Nirwana Bali is one of the best golfing experiences I have had anywhere in the world and unlike many things in life that don’t measure up the second time around, it was even better than I remembered. From the moment you step inside the clubhouse there is a feeling of tranquillity and ease that follows you onto the course for your round. The 18 holes Norman has shaped through the tropical rain forest and landscape are as visually beautiful as they are challenging. Every round at Nirwana Bali is enjoyable no matter what your final score and each will bring new experiences on a golf course surrounded by beauty. Nirwana is an amazing golf course in an incredible part of Bali. It is a must play for lovers of golf and is an experience you will definitely want to come back to. While regions such as Victoria and New South Wales can boast more courses currently featuring in Australia’s Top 100, Perth in Western Australia has 13 courses in this ranking and also has the benefit of a fantastic year round climate - perfect for golf. 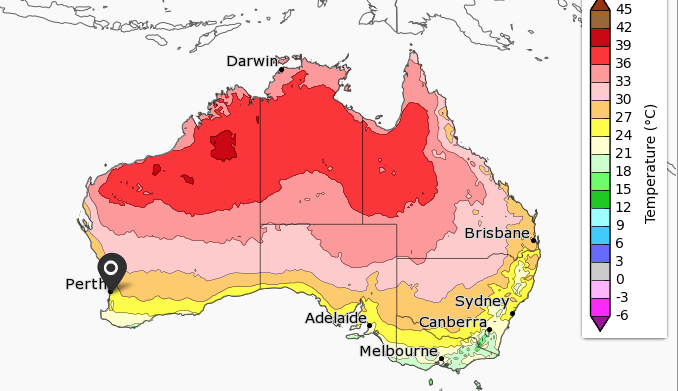 Summer days in WA can reach 40 degree Celsius, but the cooling afternoon breeze provides relief from rising temperatures. Autumn and Spring are the best seasons to enjoy golf at Western Australian courses and many golf tourists remark that the conditions for golf at this time of the year are better than they have experienced anywhere else in the world. Plus, the mild winters mean that an afternoon tee time during these cooler months also provide for ideal golfing weather. Many golf tours in Western Australia are combined with great experiences off the course, and being based in Perth gives International Golf Specialists the advantage of being able to provide firsthand knowledge of the best areas to visit to make the most of your time in this amazing city. If you are looking for special rates and tee times at courses like Joondalup Country Club, The Cut, Meadow Springs and The Vines, International Golf Specialists have the contacts and deals in place to ensure a great golfing experience. Our Concierge Service always provides the most relaxing and hassle free golfing holiday with tee times, transportation and after game functions all taken care of. This service caters for golfing and non- golfing partners and ensures all members of a touring party are provided for. To arrange your golf tour to Australia’s fastest growing golfing destination, speak to the team at International Golf Specialists today. Australia offers everything to make a golf holiday truly memorable. With a climate that is the envy of many other nations and golf courses throughout the country which rank amongst the world’s best, visitors coming to Australia can experience great golf and more. Ranked as the 11th best golf course in the world, Barnbougle Dunes in Tasmania now ranks above the likes of Pebble Beach, Winged Foot and Turnberry. The Royal Melbourne West course comes in at number 9. To have two courses featuring so highly amongst the best in the world is a testament to the golf available throughout Australia. Kingston Heath at 20, Barnbougle Lost Farm course at 23, Royal Melbourne East Course at 28, New South Wales Golf Club 33 and Victoria Golf Club at 94 also feature in the current list of the world’s Top 100 and are places that avid golfers dream of playing. Renowned around the globe for its pristine beaches and fantastic weather, Australia offers the complete package for golf travellers both on and off the golf course. Our casinos provide superb accommodation and nightly entertainment. Our proximity to Asia and the huge selection of airlines flying into Australia means that travellers wishing to visit on any budget can have a golf package tailored for them. Golf in Australia is also extremely affordable and accessible. Augusta National in the United States may rank at Number 3 on the list of the best golf courses in the world, but is not available for play to the general public. Barnbougle Dunes however, is public access and priced so that anyone can say they have played this magnificent layout. To begin your Australian golfing adventure, contact the team at International Golf Specialists about creating the best itinerary for you and your golfing partners. International Golf Specialists are pioneering up-market golf tours to Mauritius for Australians looking for a unique golfing experience. There are 8 internationally acclaimed golf courses in Mauritius, with top golfer designers such as Gary Player, Ernie Els, Bernard Langer and Hugh Baaochi all offering first class golfing challenges and facilities. When coupled with year-round sunshine, great beaches, luxurious hotels and friendly service, Mauritius ensures a wonderful and relaxing holiday in the Indian Ocean. Mauritius is not a large island, but it is spectacular with large volcanic peaks and beautiful, pristine beaches. The country has a very interesting and colourful history, being colonised in succession by the Dutch, French and finally the British in the 18th century. The country is a melting pot of culture and diversity. The people are a mix of European, Indian and African, and while English is the official language, a local French Creole language is constantly heard in the streets. Tourism is the number #1 industry in Mauritius, with the majority of tourists coming from Europe, escaping their cold winters from November to March each year. I was there in late June, and it was 28 degrees Celsius on the day I arrived. The east coast has the most internationally recognised golf courses, with a highlight being the European Senior Tour event held at the Legends course at Constance Belle Mare Plage in December each year. On the south west coast is the golfing resort complex of Paradis and Dinarobin. Dominated by Le Morne, a towering volcanic mountain that seems to follow your every view, Paradis golf course is truly golfing heaven. The resort is situation on a remote peninsular, and the Indian Ocean can be seen on almost every tee. With Air Mauritius flying 3 times per week using modern Airbus wide body aircraft, it is a very enjoyable and comfortable experience getting to Mauritius, and that is where the fun really begins. International Golf Specialists (IGS) has both 6 and 9 night golf packages to Mauritius. Come and join one of our exclusive golf tours listed on our website, or put your own group together, and we will package it according to your personal requirements. IGS makes “great golfing experiences” happen! I have recently returned from Sabah following an inspection trip where I was hosted by the Sabah Tourist Board to assess the potential for golfing holidays for Australians. Sabah is a state of Malaysia on the island of Borneo. The island is unique in that it is divided by three separate countries. Sabah and Sarawak are part of Malaysia, Brunei is a sovereign country and Kalimantan is a territory of Indonesia. Sabah has an equatorial climate with day temperatures ranging up to the mid-thirties Celsius and high humidity from the regular rainfall. The wet season is during the North East Monsoon from October to February and the drier season during the South West Monsoon from March to September and typical of tropical climates, it is clear skies in the morning with usually heavy rain in the afternoons. I inspected 5 golf courses in Sabah, with 3 being stand outs. I was very impressed with the golf tourism infrastructure of Sabah. Magnificent five star resorts with challenging and pleasurable golf courses are a great combination for Australians looking for a golfing holiday away from the more predictable Asian destinations. 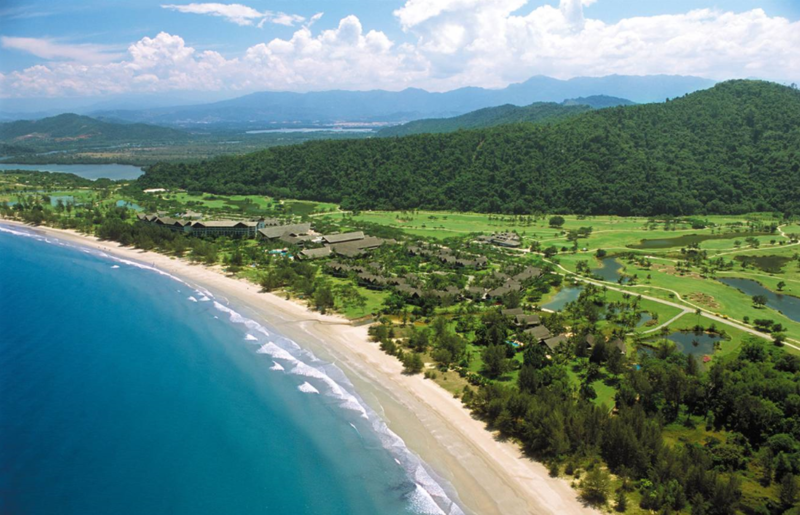 There are direct flights from Australia to KK with Malaysia Airlines, and I believe Sabah represents tremendous value if you are looking for a tropical and relaxed golf holiday experience. Bali - A Golfing Treasure! Bali is a wonderful and relaxing destination for Australian tourists, however it is even more special for those wanting a tropical golfing experience. Just 3 ½ hours flying time from Perth, and a range of low cost and full service airlines to choose from, Bali offers a convenient and affordable holiday destination like no other place. The combination of warm, tropical weather, a great choice of simple to luxury accommodation, beautiful beaches and a friendly local culture make for a pleasurable time on this island paradise. Throw in some great golf courses and you will be returning to Bali with your golf clubs on a regular basis. There are four international standard golf courses in Bali. Located on the west coast of Bali next to one of the most sacred Balinese temples, Tanah Lot, the Nirwana Resort is a Greg Norman classic design. Winding your way through rice paddys to the ocean and back, Nirwana is the finest course in Bali, and one of Norman’s proudest course designs … a must play on any golfing visit. 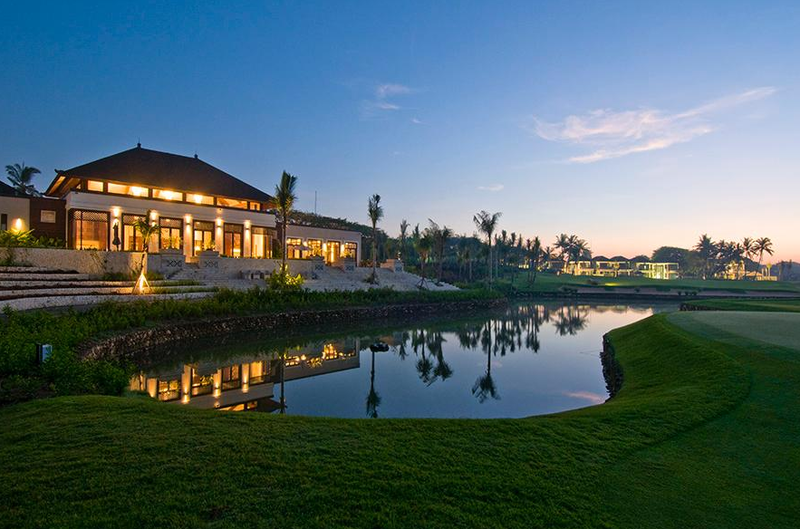 Located on the East coast of Bali in Pecatu, New Kuta has staged Indonesian PGA events over the years. With a links design, situated on the cliffs of Ulawatu and overlooking magnificent surfing beaches, you will feel challenged by this championship course. Set in the volcanic hills of Bedugal surrounded by lush green hills this is the oldest course in Bali. It takes some time to get there by road from the coast, however it is worth the effort to play this scenic and challenging course and see your golf ball fly in the higher altitude of the mountains. Currently closed for renovations and expected to be open early 2014, this course has been totally redesigned and will form an integral part of the new Shangri La Golf Resort. Nusa Dua will be a valuable addition to the top quality golf courses of Bali. International Golf Specialists arrange golf tours and packages to Bali that can include these courses, as well as accommodation, transfers and tours. Contact us now on our website for more information and the offer of an obligation-free quotation. Golf in WA and around Australia offers the first time visitor an exciting choice of destinations and courses to choose from and for those returning, another unique golfing experience. Golf tours in WA and around Australia are often put together by an individual for themselves or a group in the belief that creating their own itinerary will keep costs down. The time involved and the disappointment that this way of booking a golf holiday can bring will often outweigh any perceived benefits. International Golf Specialists offer overseas and local guests the best options of golf and accommodation for golf tourists. Our knowledge of Australian courses, cities, weather conditions and off course activities takes the hassle out of organising an itinerary. Our Golf Packages can be customised to suit small or large groups and with our local and international contacts we can arrange the best tee times at many of the top courses in Australia. An International Golf Specialists golf holiday begins well before departure with the knowledge that a travelling party’s itinerary is already taken care of and the only thing for them to concentrate on will be great golf at a fantastic destination. To begin arrangement of your next ‘Great Golfing Experience’, contact the team at International Golf Specialists. Visiting Western Australia for golf and pleasure is so much easier when your itinerary is arranged with International Golf Specialists. With over 35 years of experience in the travel industry, we tailor packages to include golf, accommodation and all other requirements for visitors to our beautiful state. With so many great golf courses, choices of hotels and leisure activities available throughout Western Australia, a personalised International Golf Specialists itinerary allows our guests to make the most of their time here. Boasting more sunshine hours than any other Australian capital city, Perth is home to some of the best golf courses in Australia, with visitors having a variety of links, championship and resort style courses to choose from. With many quality hotels such as Duxton, Mantra, Pan Pacific, Rydges and Crown Promenade, we can recommend the best suited for all golf traveller requirements. The logistics of getting from airports to hotels and to golf courses and other attractions can be the most difficult part a golf holiday. With small and large luxury coaches, private chauffeurs or self- drive rental vehicles provide transport options for any size group visiting Western Australia. The availability of Fully Escorted packages and on course caddy services make the most relaxing of golfing holidays for the discerning traveller. For more information about the amazing experiences to be enjoyed on West Australia’s golf courses and the superb accommodation and attractions on offer throughout the state, please contact International Golf Specialists to begin planning your next golfing holiday. The opportunity to play at Jacks Point during a recent visit to Queenstown was one that I couldn’t turn down. 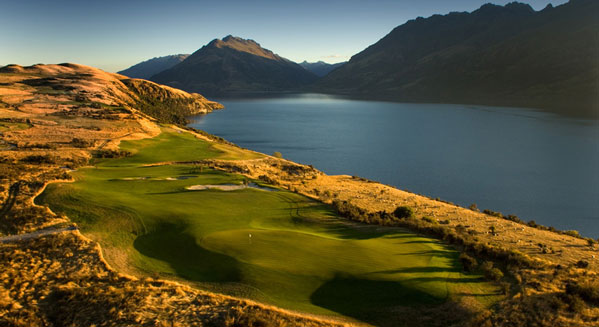 Situated on the shores of Lake Wakatipu and with a backdrop to the slopes of the spectacular mountain range, The Remarkables, the scenery is so visually stunning that golfers could be forgiven for losing focus on the game at hand. The front nine opens with a par four and I soon found out that staying on the fairway and away from the tussock grass was going to save me a lot of shots. Measuring 6388 metres from the championship tees, the course requires accurate driving. Missing the fairway can easily mean losing a ball and besides, there is too much scenery to take in to spend time looking for a lost ball. The course is maintained beautifully and hitting from the fairways provided a perfect lie every time. Iron play needs to be accurate to hit the right part of the undulating greens which again, were in terrific condition and were consistent and true. From the beginning to the end of the round, I continually found myself amazed by the spectacular surroundings and great golf holes which have been carved into some of the most spectacular landscapes in the world. There are so many different aspects to Jacks Point. With the mountain backdrop, there are holes that make you feel as if you could be playing somewhere in the Swiss Alps and other parts of the course with stone walls running along the fairways and bordering the tee boxes giving the impression you could be playing Scottish links golf. With each hole having its own uniqueness and amazing vista, my round at Jacks Point is easily one of the most memorable rounds I have ever played. Whether hitting to the downhill par 3, 7th hole with its green perched on the edge of the crystal clear waters of Lake Wakatipu or teeing off from one of the elevated tee boxes facing toward The Remarkables and watching your ball flying like a tracer bullet against the slopes of the nearby mountain range, Jacks Point provides every golfer with an amazing golf experience and one that I certainly can’t wait to get back and try again. International Golf Specialists (IGS) can take you to Jacks Point and other great golf courses around the Queenstown and Otago region of New Zealand on one of its exclusive golf tours. Contact IGS now for an obligation free discussion and quotation on the virtues of playing golf in New Zealand. We promise you a “great golfing experience”! Mauritius... "An Indian Ocean Golfing Paradise"
I have recently returned from visiting Mauritius on a research trip for new golfing experiences … and what an experience it was! This was my first time to Mauritius, and I was hosted by Air Mauritius, the national airline of Mauritius and Beachcomber Tours, the Australian tour wholesaler who specialise in sending Australian tourists to Mauritius. Mauritius is not a large island, but it is spectacular with large volcanic peaks and beautiful, pristine beaches. The country has a very interesting and colourful history, being colonised in succession by the Dutch, French and finally the British in the 19th century. The country is a melting pot of culture and diversity. The people are a mix of European, Indian, Asian and African, and while English is the official language, a local French Creole language is constantly heard when people gather in the shops and streets. Tourism is the number #1 industry in Mauritius, with the majority of tourists coming from Europe, escaping their cold winters from November to March each year. I was there in the Mauritian “winter” in late June … it was 27 degrees Celsius on the day I arrived! I was escorted on this trip by Rod Eather, Managing Director of Beachcomber Tours and he was a wonderful host. We inspected 7 international golf courses and 6 hotel resorts across the country. The east coast has the most internationally renowned golf courses, with a highlight being the European PGA Senior Tour event held at the Legend course at Constance Belle Mare Plage in December each year. There are also great courses designed by Ernie Els, Bernhard Langer and Hugh Baiocchi that certainly get the senses racing when preparing to play these challenging courses. On the south west coast is the golfing resort complex of Paradis and Dinarobin. Dominated by Le Morne, a towering volcanic mountain that seems to follow your every view, Paradis golf course is truly golfing heaven. An easy walking course at virtually sea level, the resort and course is situation on a peninsular, and the Indian Ocean can be seen on almost every tee, and comes into play with many water carries and lagoons. Also on the south west coast are 2 other impressive courses that are “must play”. The Heritage and Tamarina are both a short drive from Paradis Resort and offer quite diverse golfing experiences. Both have spectacular views of the coastline with mountain backdrops and significant elevation changes. I was so impressed by the relaxed and quality golfing experience of Mauritius, International Golf Specialists has already developed a 7 and 10 day golf tour for Australians, with the first tours to commence this October. Tour dates, itinerary and prices are being finalised and will be listed on the website by 19 July. If you sign up to the newsletter or social media we will advise the tour details prior to launch. I invite you to join me and other keen golfers to visit Mauritius and play their great courses … the only thing to consider is getting your golf game into shape before you touch down at Mauritius International Airport. Air Mauritius has recently increased flights from Australia to Mauritius to 3 per week. Departing Perth at lunchtime, and arriving at your Mauritian resort in time for dinner is a great way to start your Mauritian golfing experience.